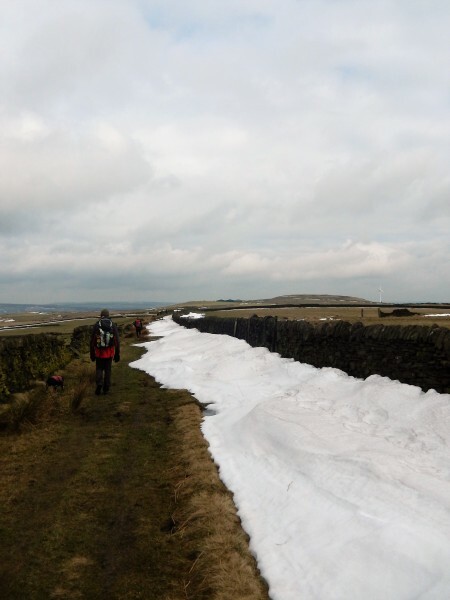 Sunday March 25th. 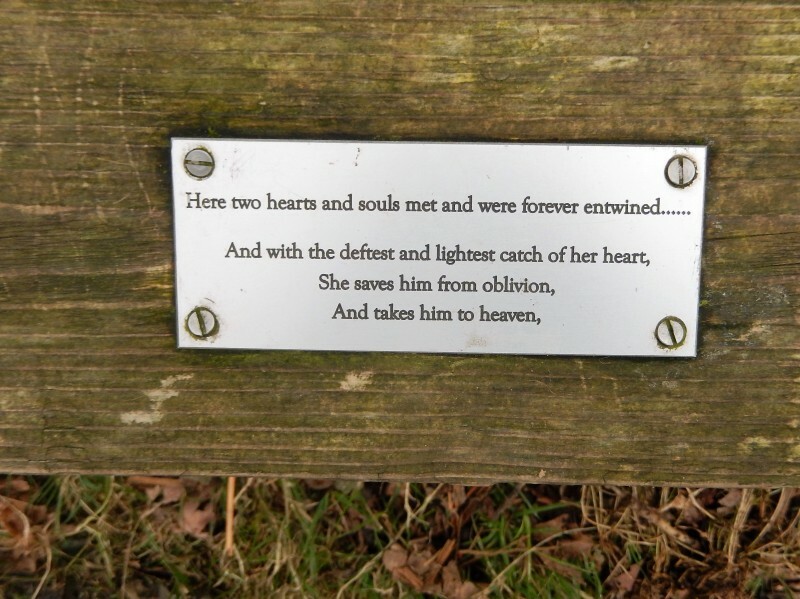 A Score to Settle. 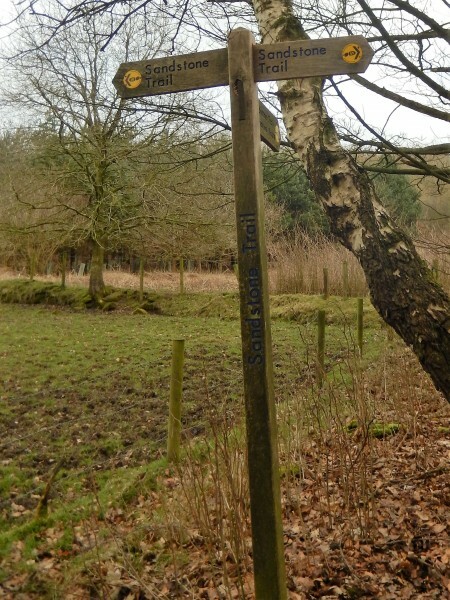 18.5 miles. 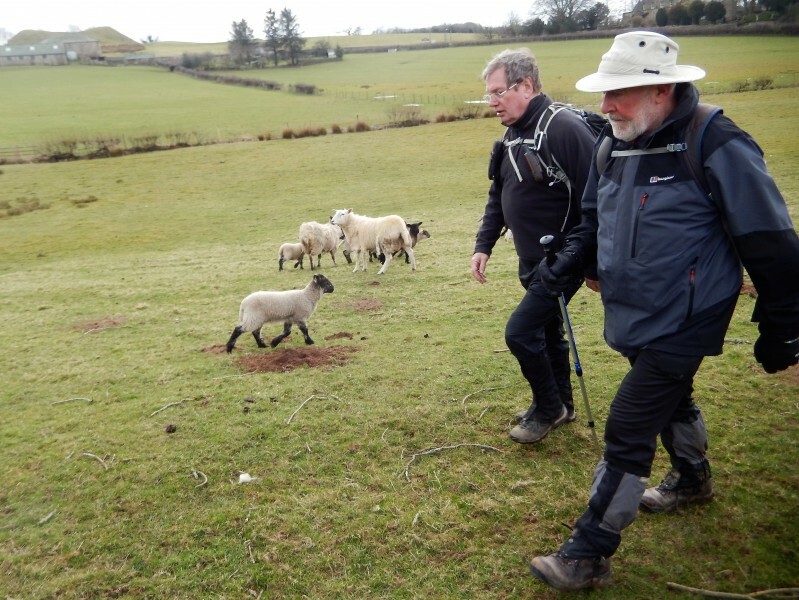 Leaders: Neil and Howard Smith. 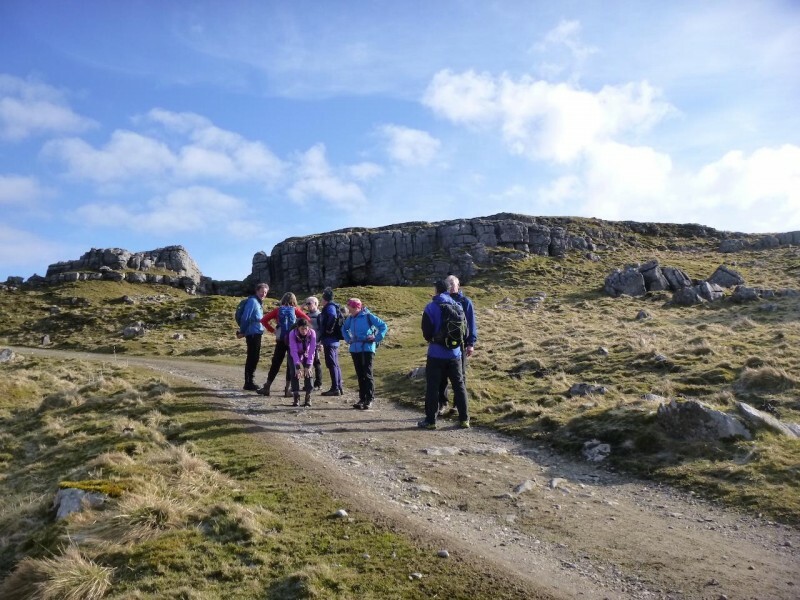 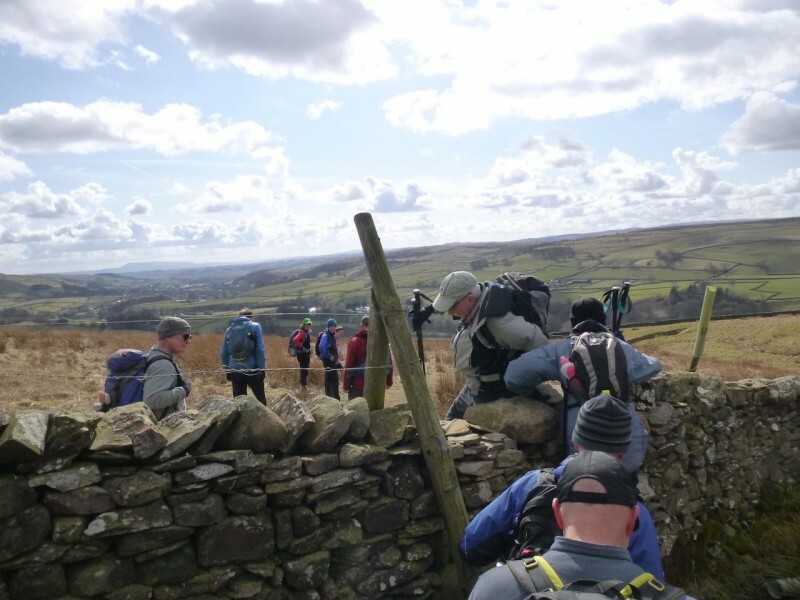 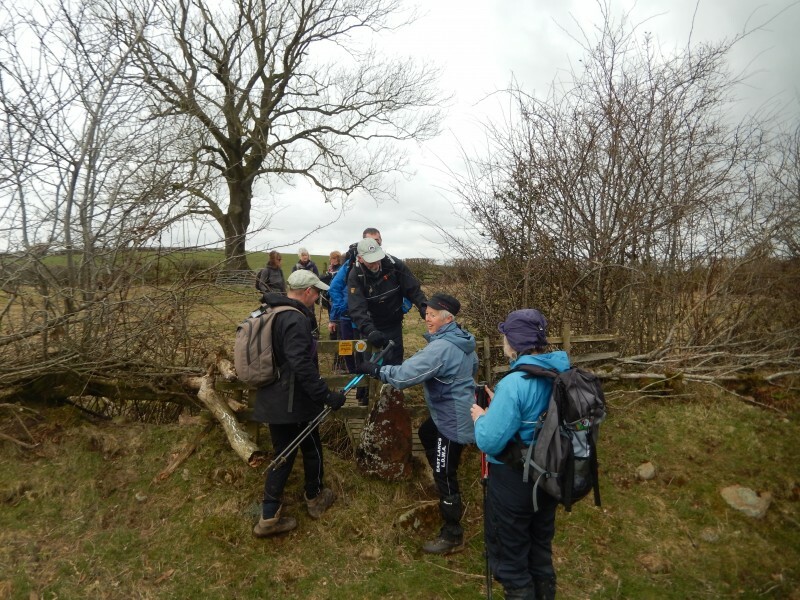 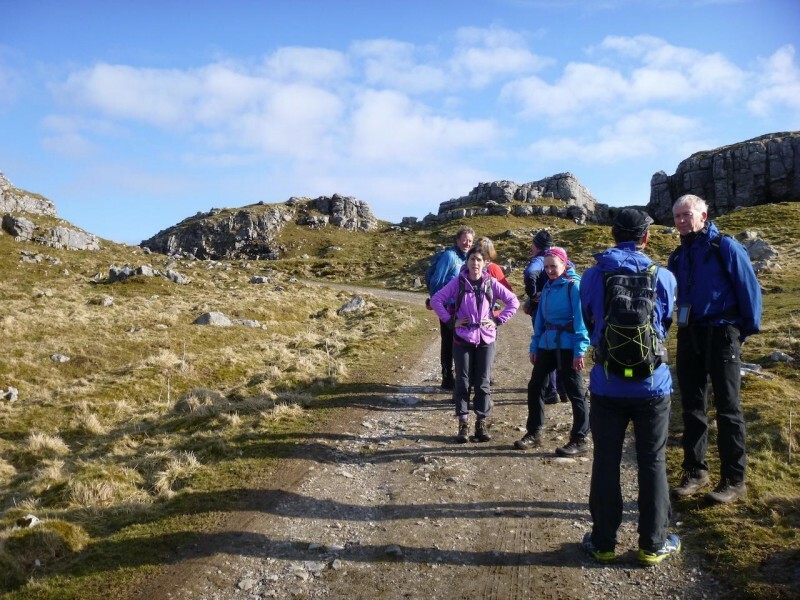 18 walkers from various clubs turned up (despite the loss of an hours sleep) on a beautiful and bright sunny morning to set off from Settle, with a nice steady climb to start with taking us towards Langcliffe and the Pennine Bridleway. 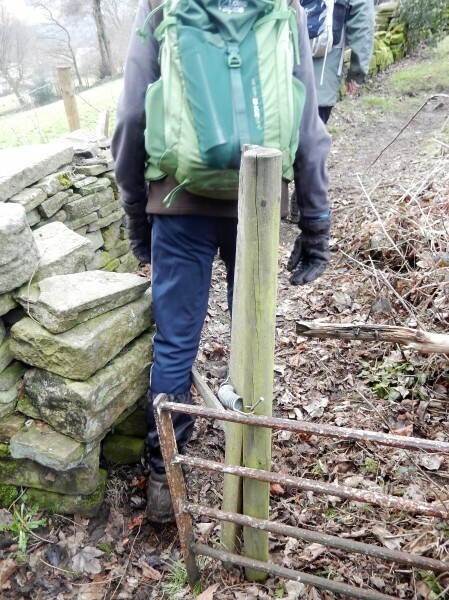 This was followed for just over 2 miles before leaving it in a north easterly direction on a quite soggy path to start with to our first morning stop at the nature reserve at the side of Malham tarn. 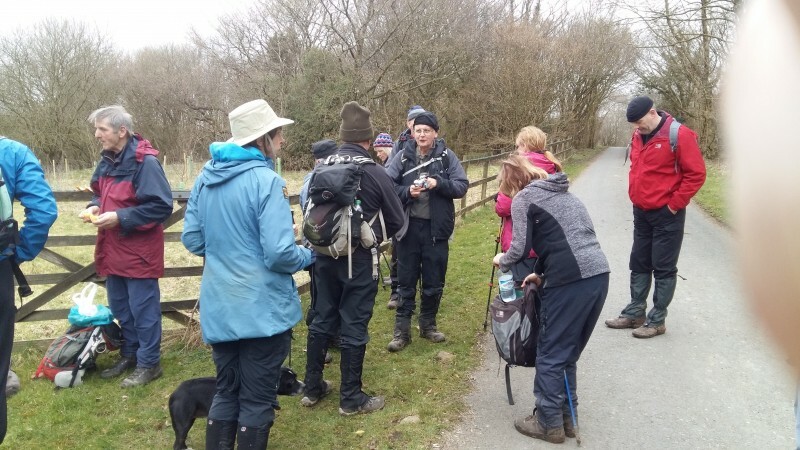 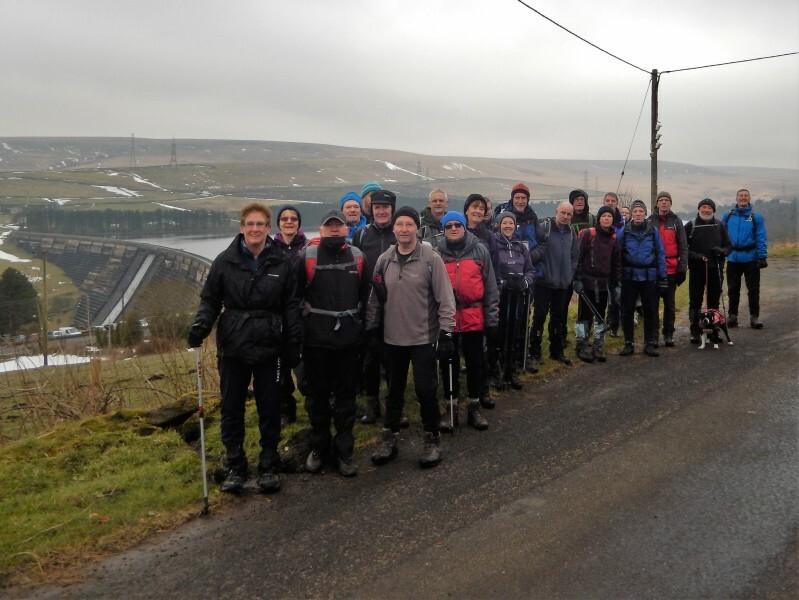 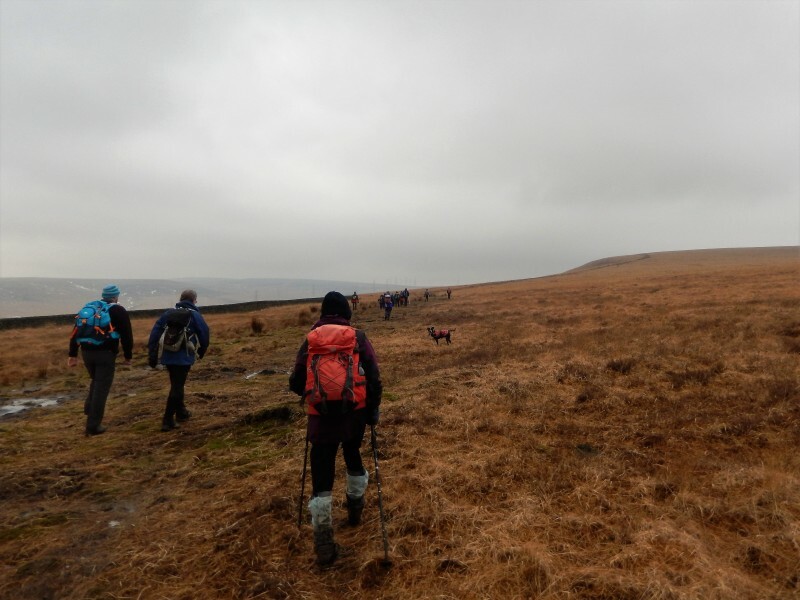 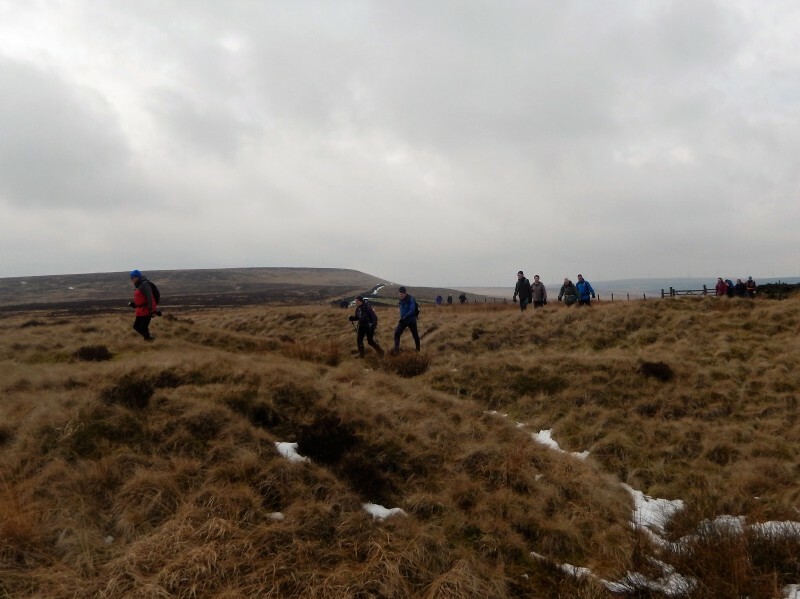 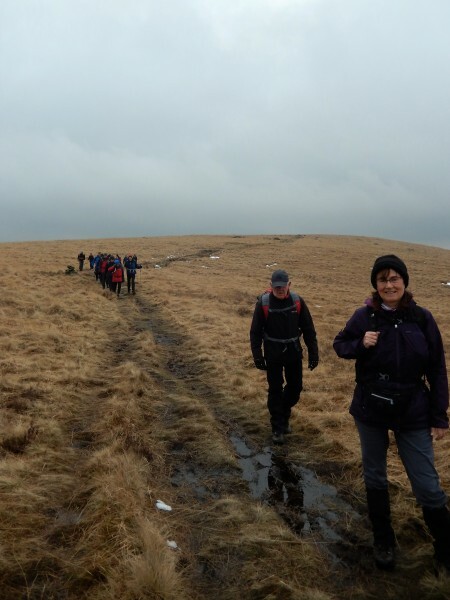 Everyone now refreshed and most with less clothing on, continued to then join the Pennine way which we then kept to for several miles. 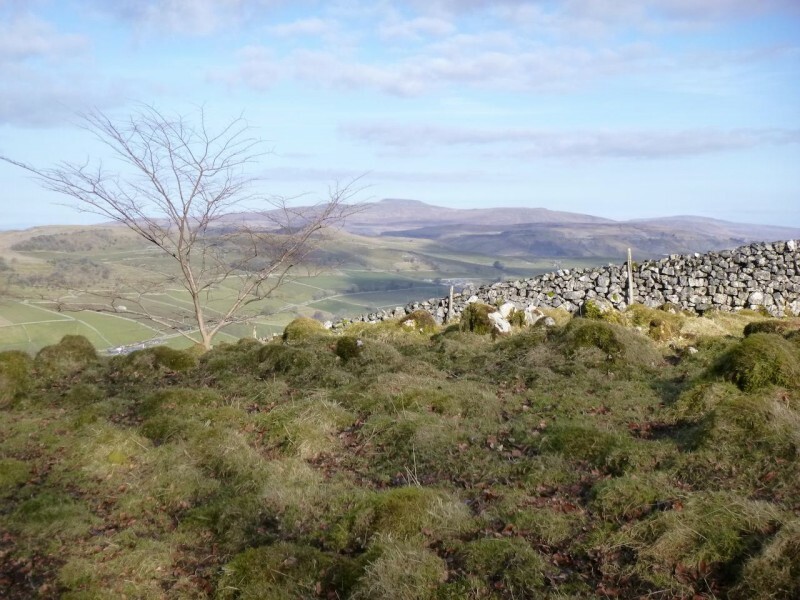 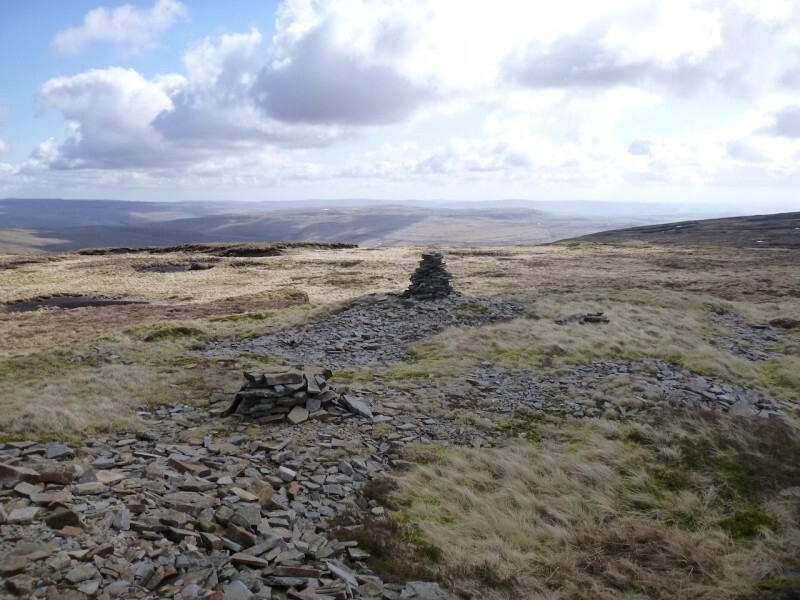 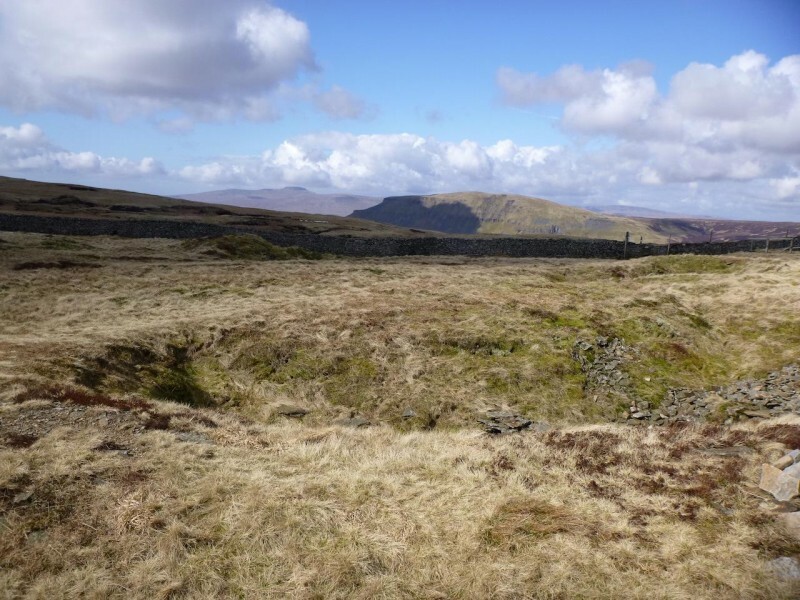 This took us up eventually to the summit of Fountains Fell at a height of 2,192ft. 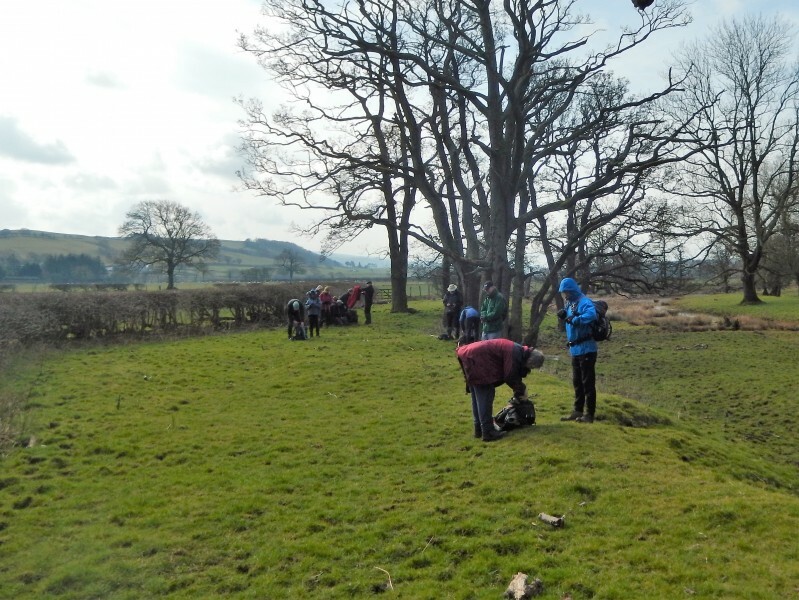 The name fountain derives from the ownership of the land in the 13th century by the Cistercian monks of Fountains Abbey (25 miles to the east) who used it for sheep grazing. 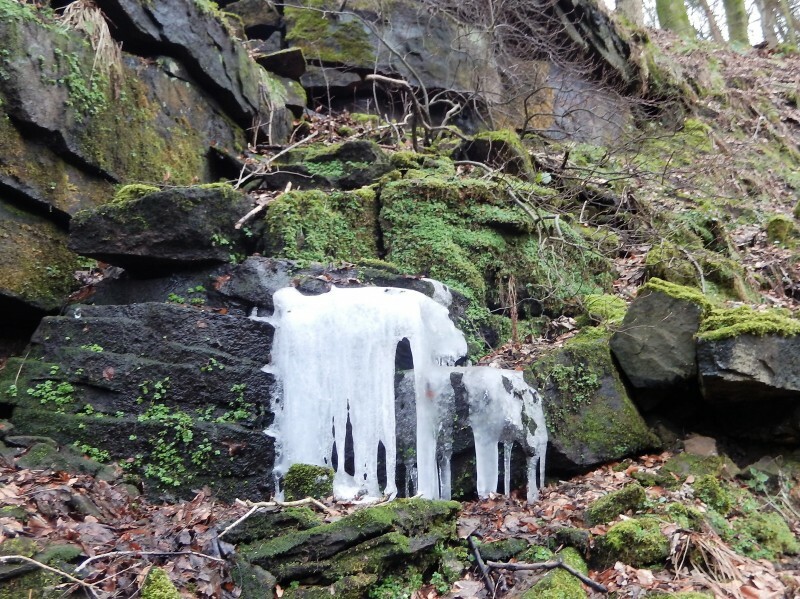 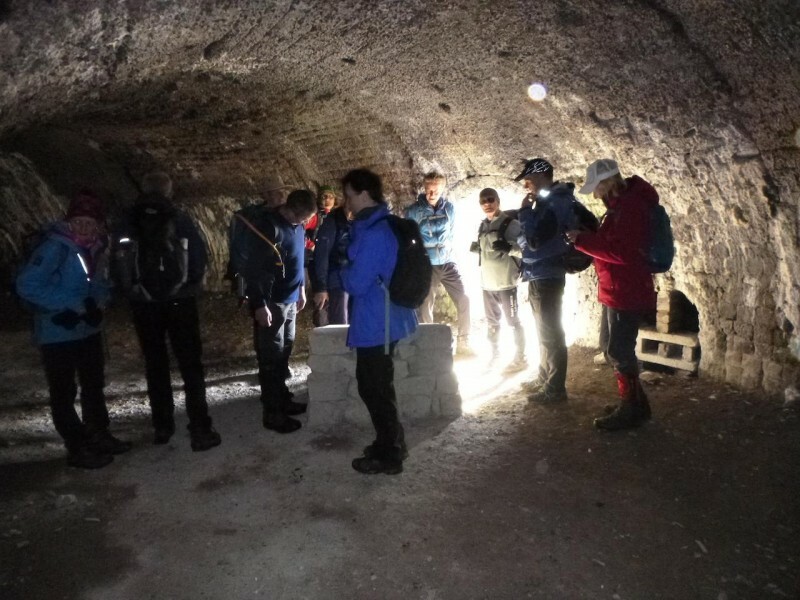 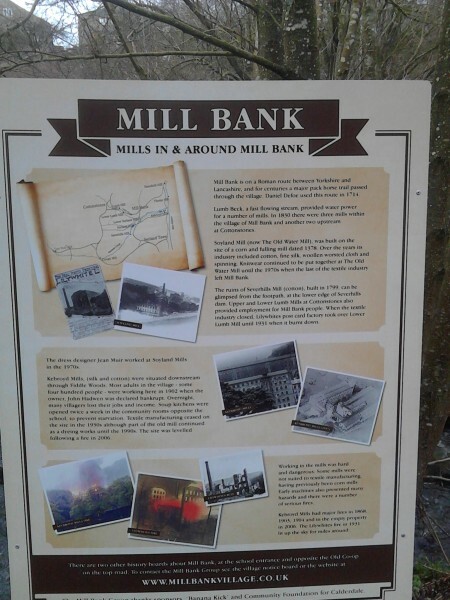 Coal was mined on the summit from 1790 to 1860 and was used for Lead smelting in the area. 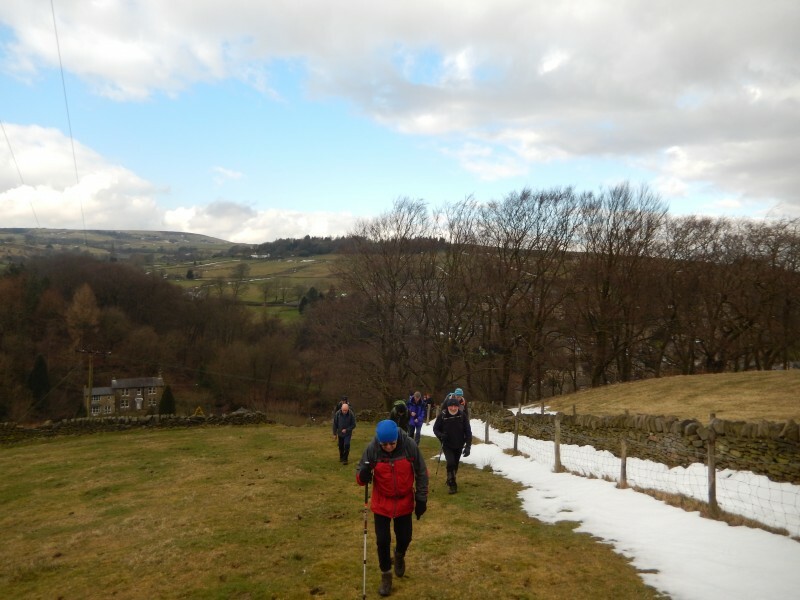 There are still signs of this activity at the top, from where we descended on a somewhat tricky uneven path going over one slab of icy snow. 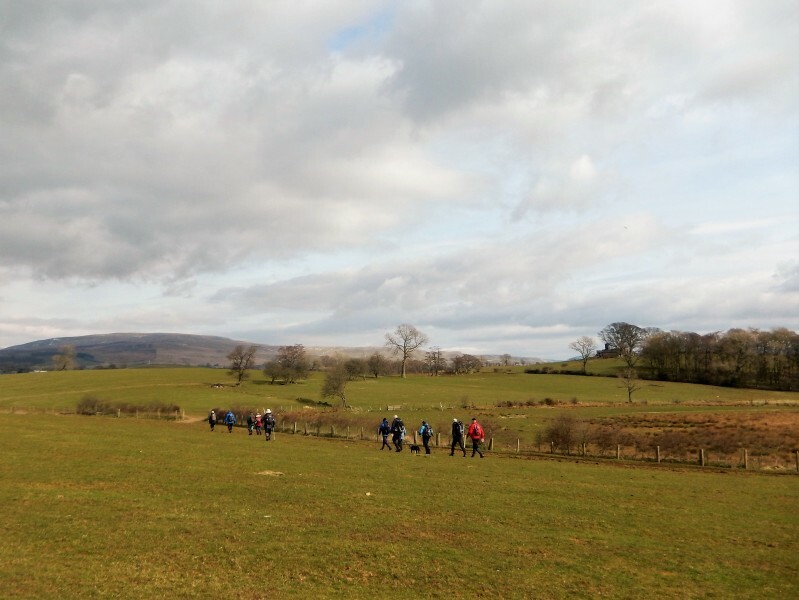 Here we passed a group of girls coming the other way (we think they were on D of E duties) who all but one had just negotiated it very cautiously. 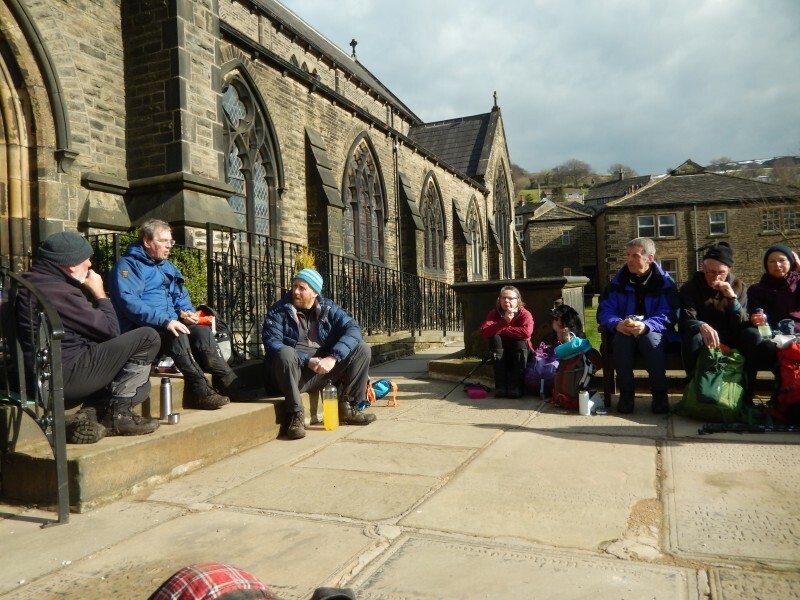 With everybody safely down at the road we stopped for our lunch break sheltered behind a wall on nice firm ground to enjoy a bit more of the warm sunshine. 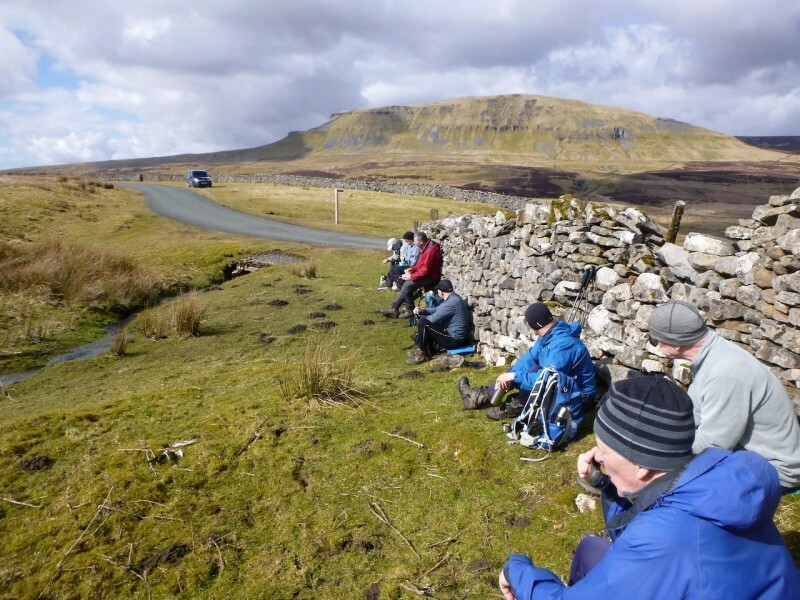 There was now a bit of road walking to do to get to the next track but this was compensated by the magnificent view of Pen-y-Ghent immediately to our right. 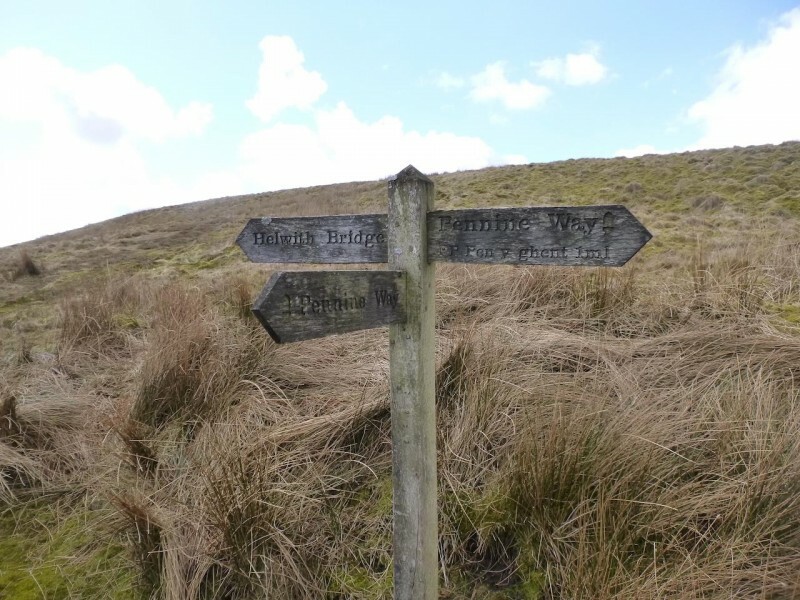 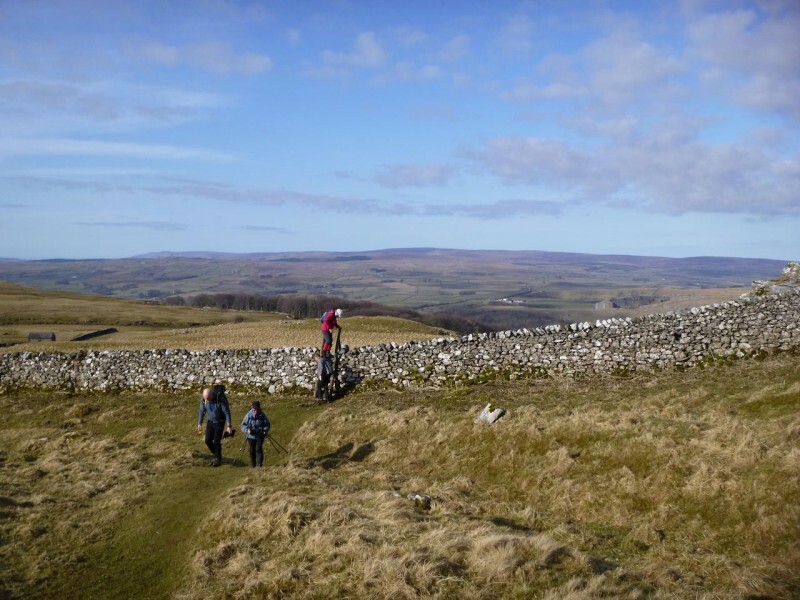 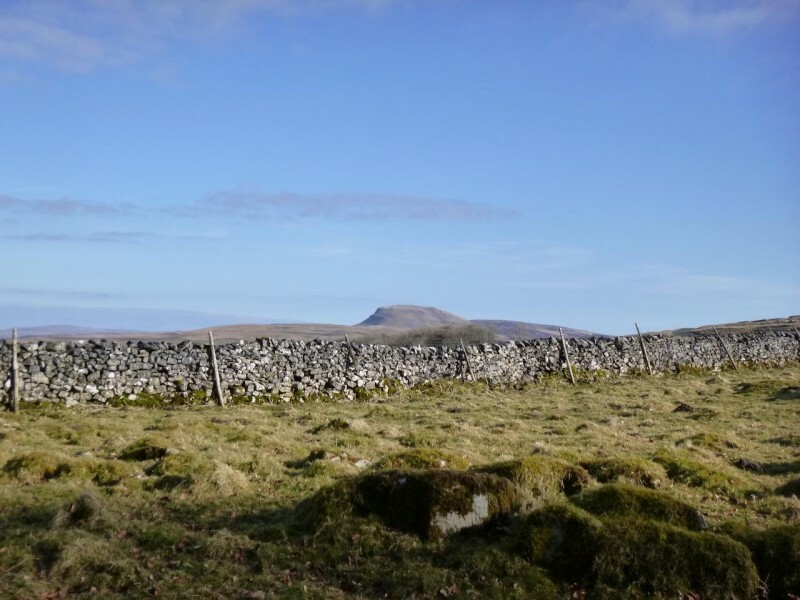 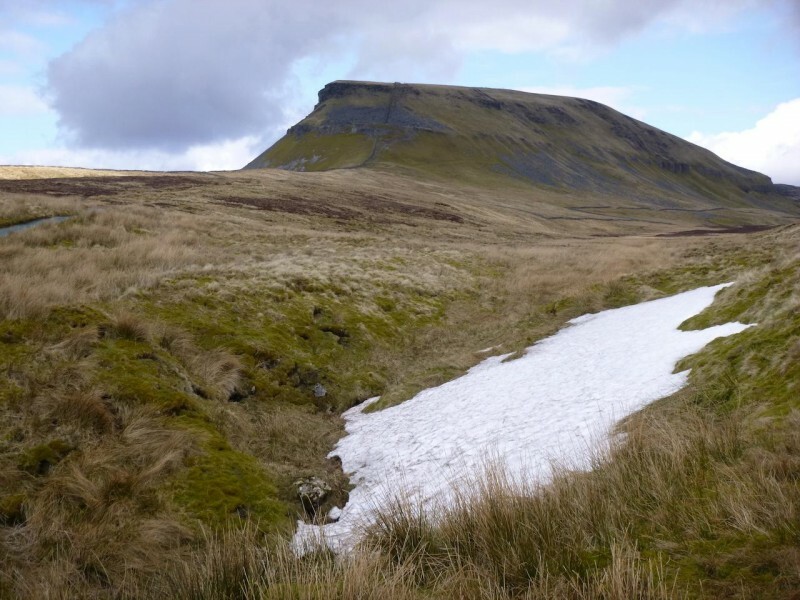 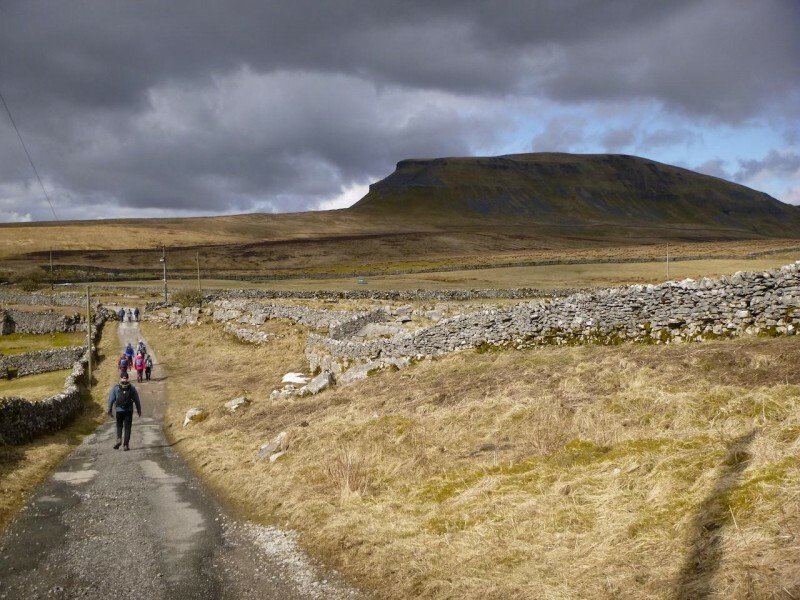 We then turned onto the track leading to Pen-y- Ghent but within a few hundred yards turned off it to the left heading in a southerly direction to eventually pick up the Ribble Way which we followed until reaching Stainforth. 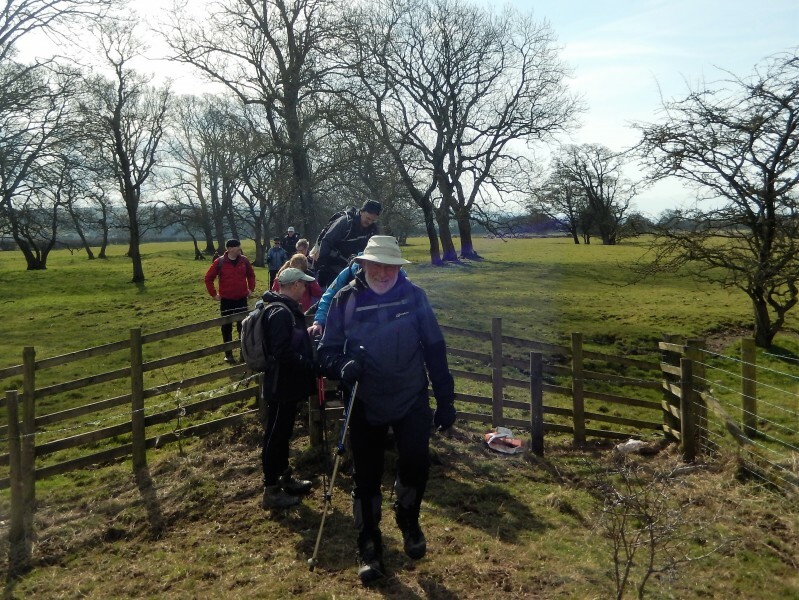 Some people took advantage of the public toilets here before continuing on the last leg of the walk. 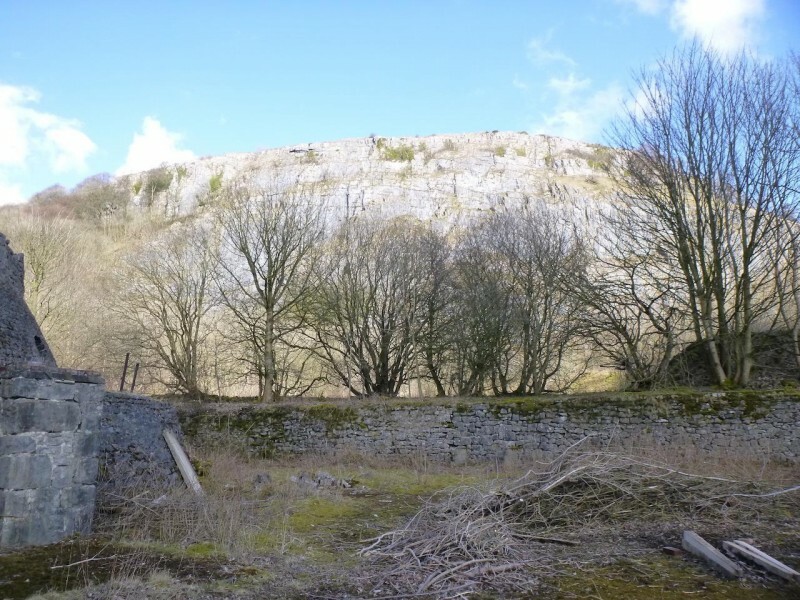 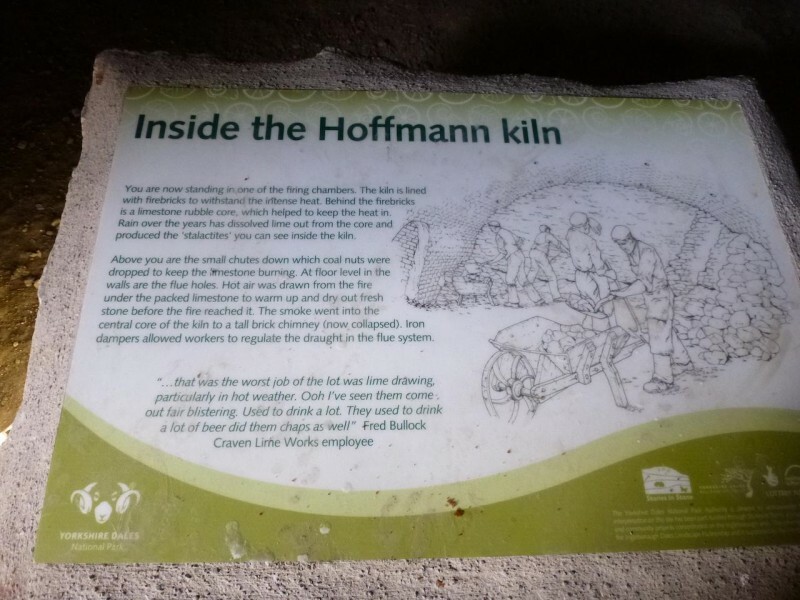 A very short section of busy road then took us through some nice pleasant fields to the Hoffmann Kiln lying right below the face of Stainforth Scar from where all the lime for the Kiln was sourced. 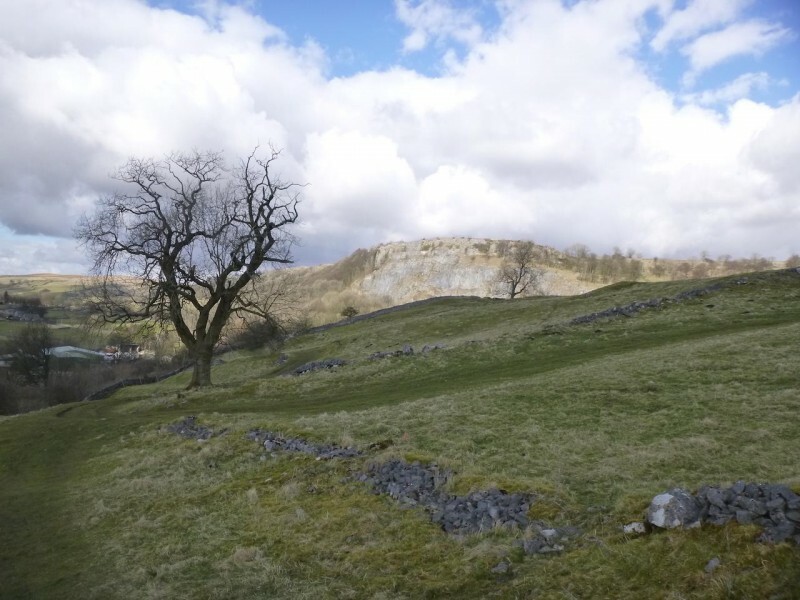 After this well preserved look back into history we continued through some more fields and one minor road to get us back into Settle for about 3-50pm. 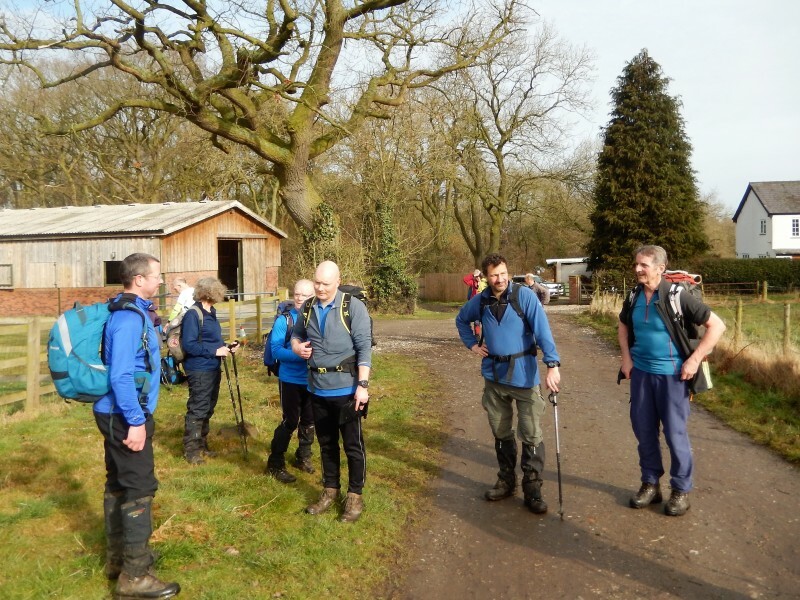 18.5miles completed so we did not quite get the "SCORE" but certainly the result. 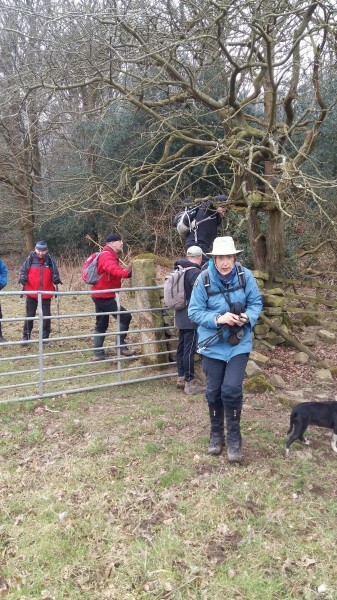 Thanks to everyone for coming, (Rocket Ron for pacemaker -thought I was going to need one) and Howard and Gordon for the pictures. 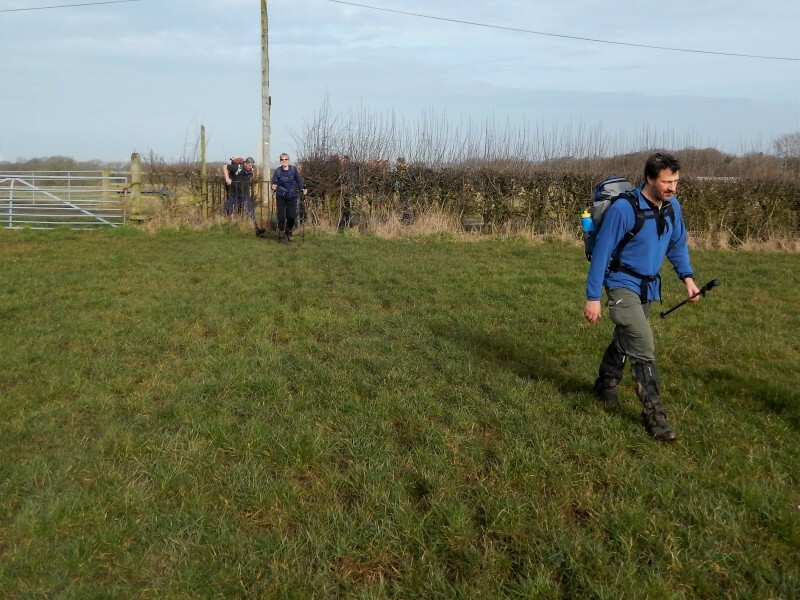 Thank you to Gordon for the pictures below. 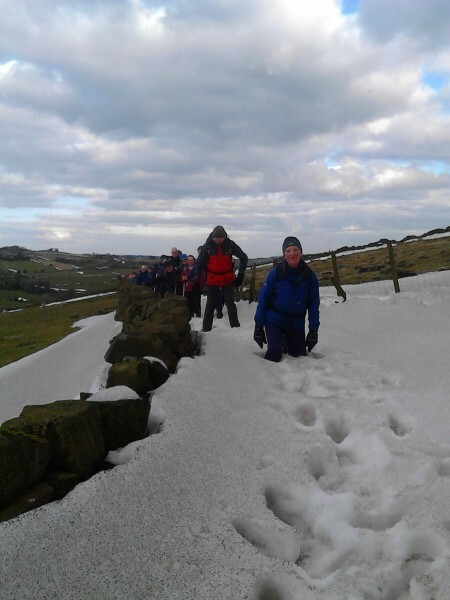 Wednesday March 21st. 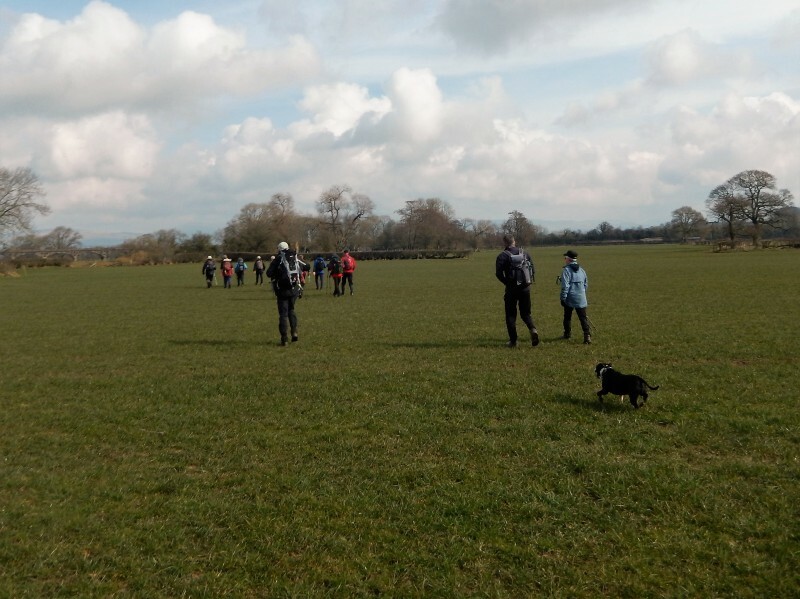 A Luney Walk. 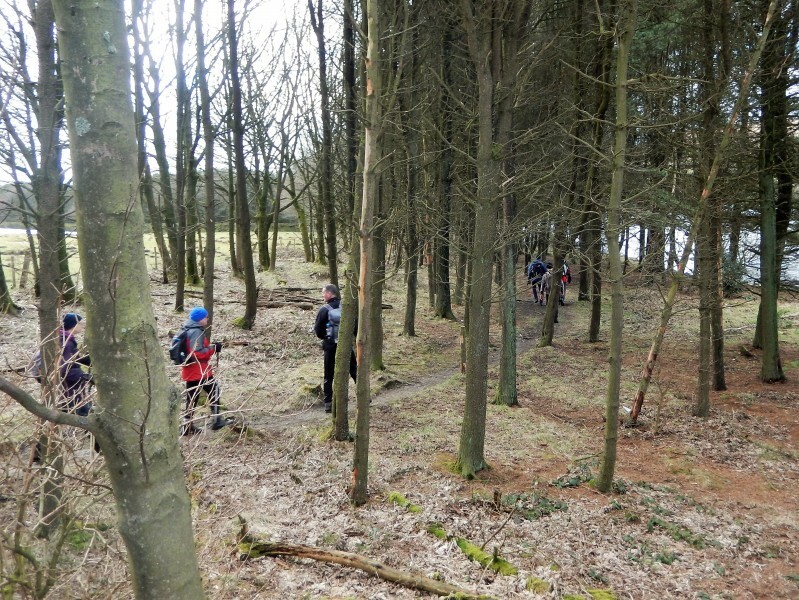 17.5 miles. 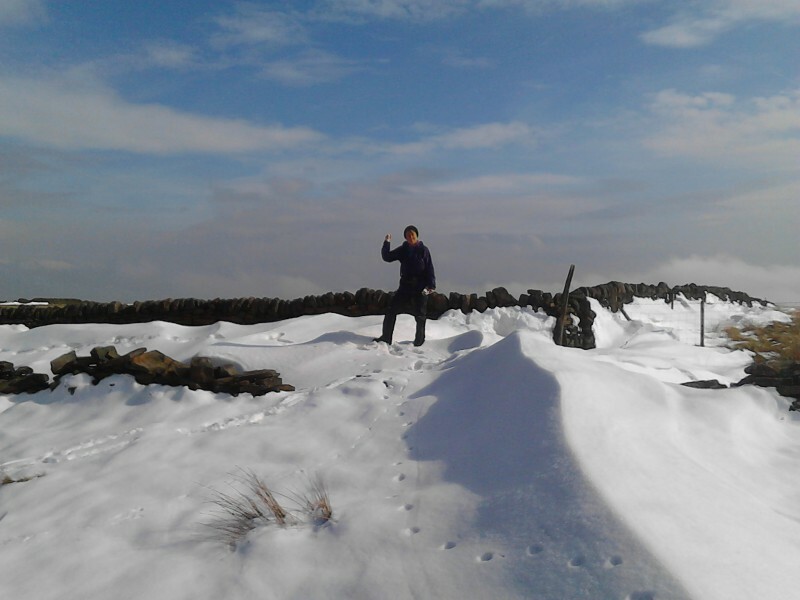 Leader: Roger Jackson. 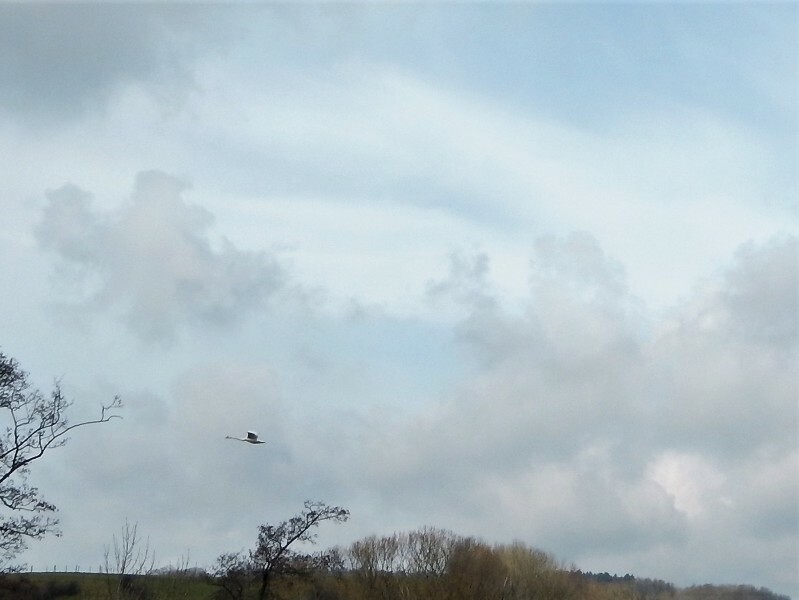 Weather; Cloudy but fine with periods of sunshine. 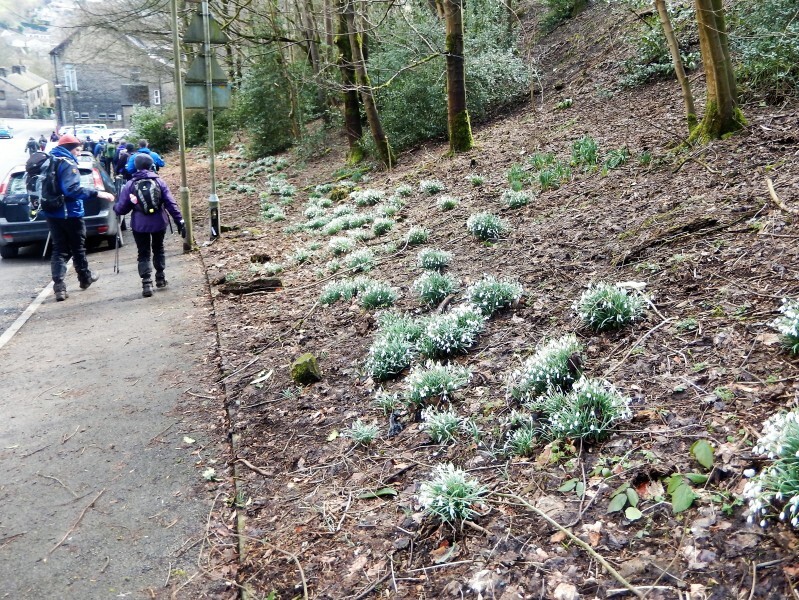 Seventeen people and the ever young Maude the Magnificent, set off from Hornby car park. 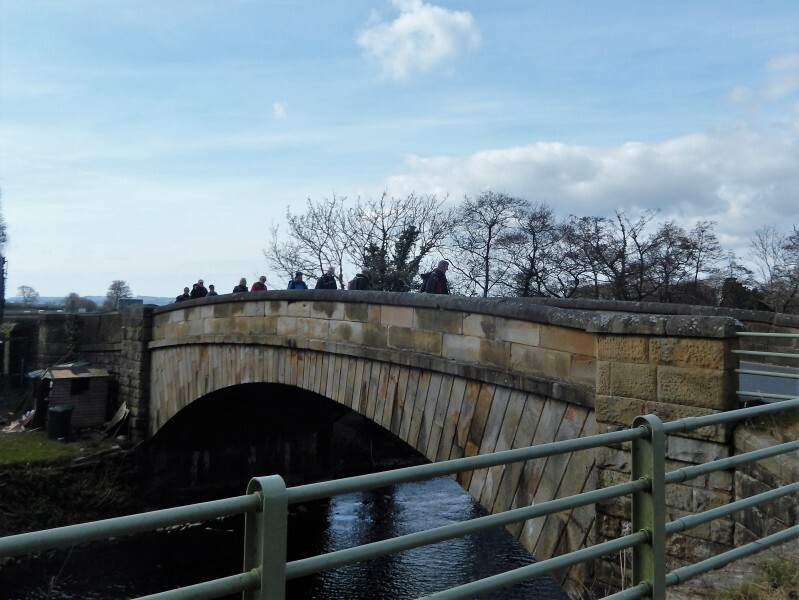 We crossed the bridge, admiring an impressive view of the Castle, then turned sharp left to follow the river Wenning. 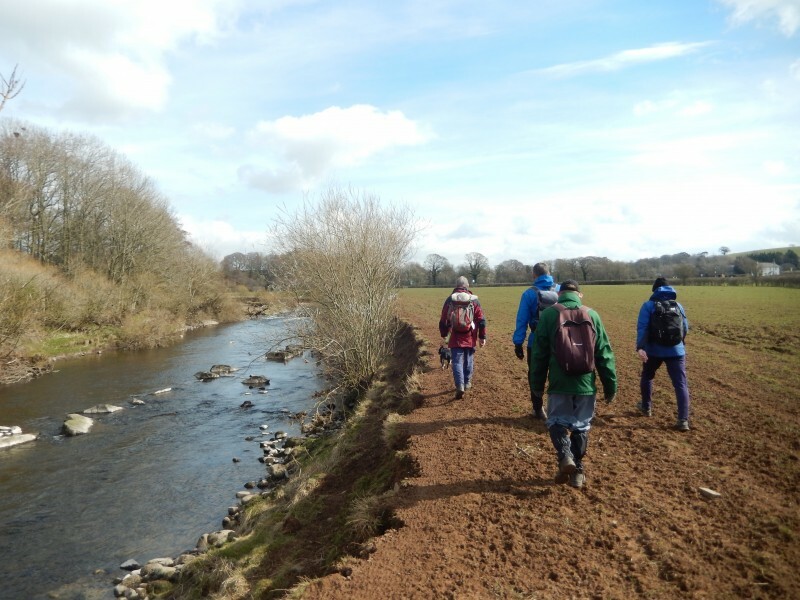 After approximately one mile the Wenning flows into the River Lune and here we turned right along the river bank, to follow the Lune, eventually reaching the Loyn bridge. 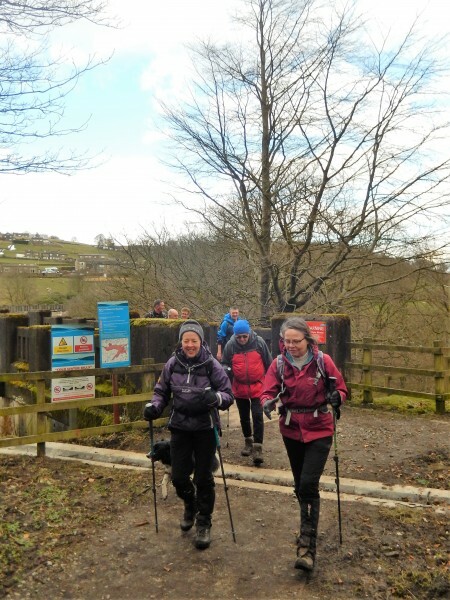 Onwards, still following the Lune, to the Railway Viaduct at Melling where we had our morning coffee stop. 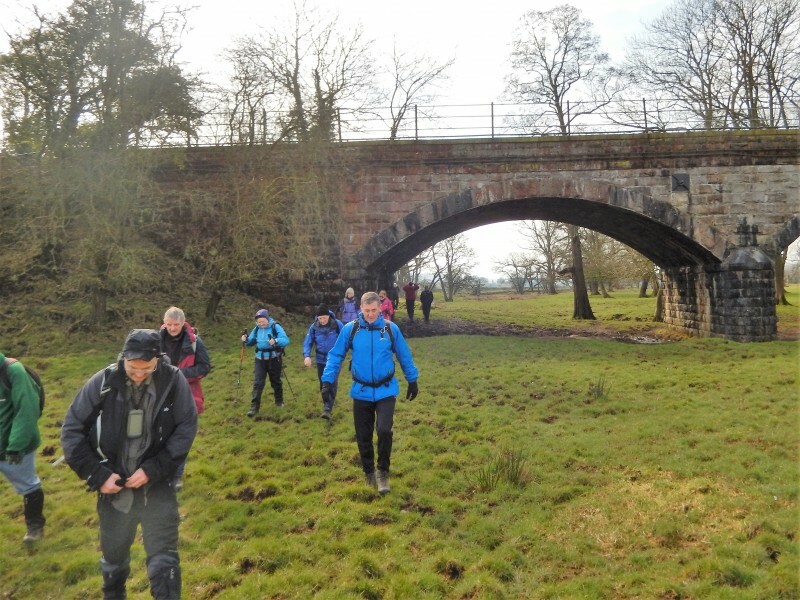 Then under the Viaduct to the Great Bridge near Wrayton where we left the river. 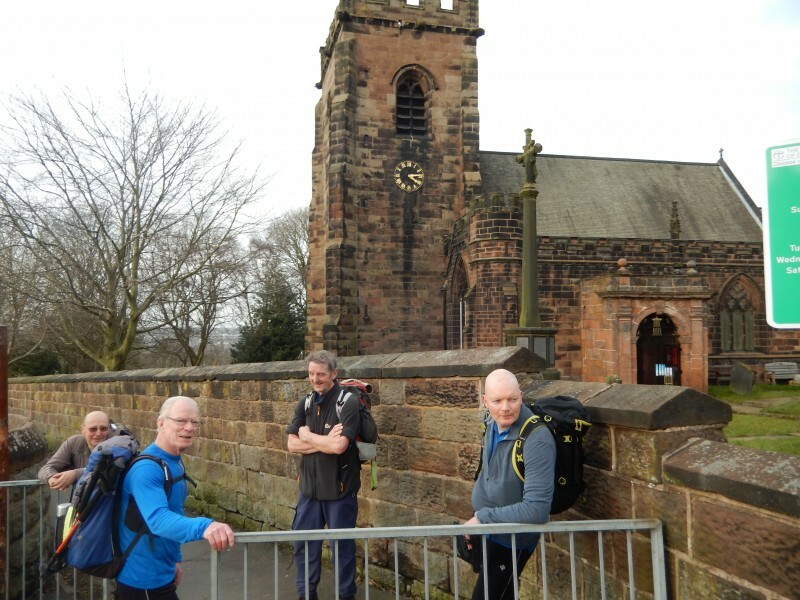 After a short walk down the road to Cantsfield, we headed across the fields, through two farms, to Burton in Lonsdale for a pleasant lunch break next to the picturesque church. 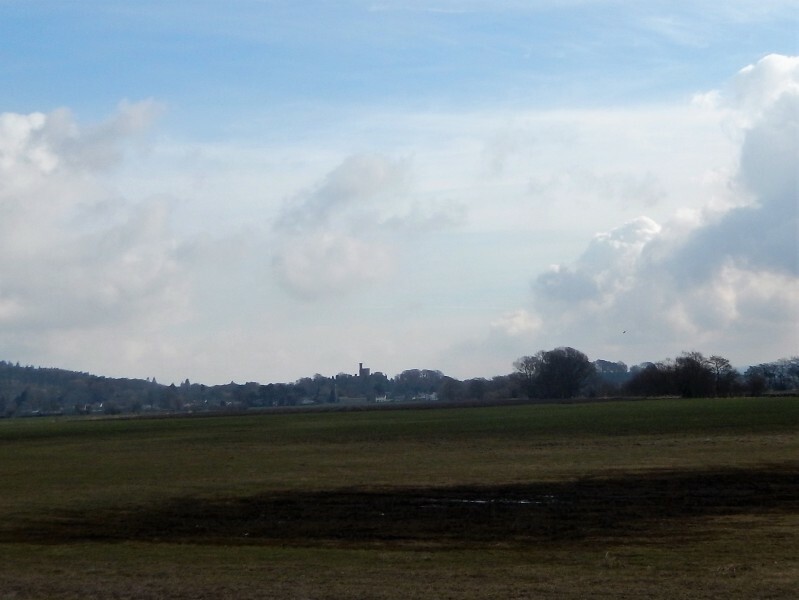 Now past halfway we walked past Clifford Hall and then to Welling, crossing more fields and heading back towards Hornby passing the Motte and Bailey used by Normans as a defensive position to defend the river. 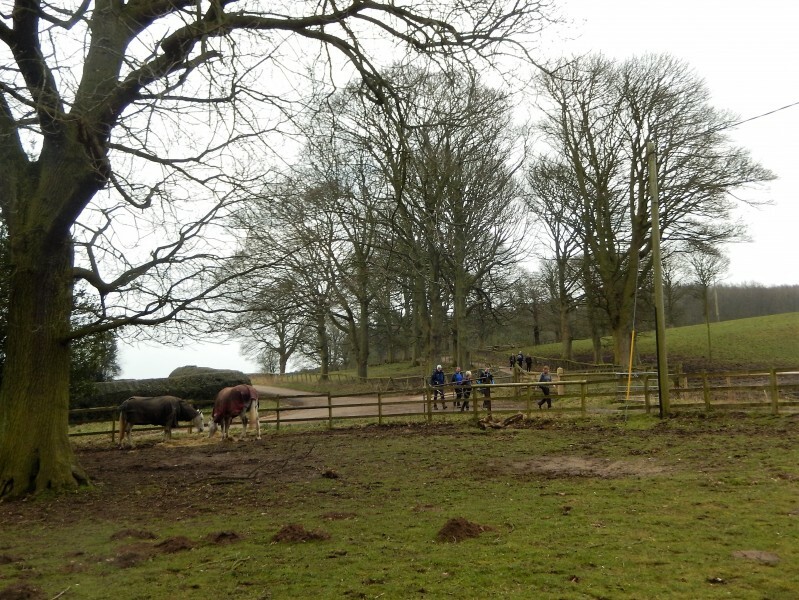 Now it was just a walk down the road back to the car park. 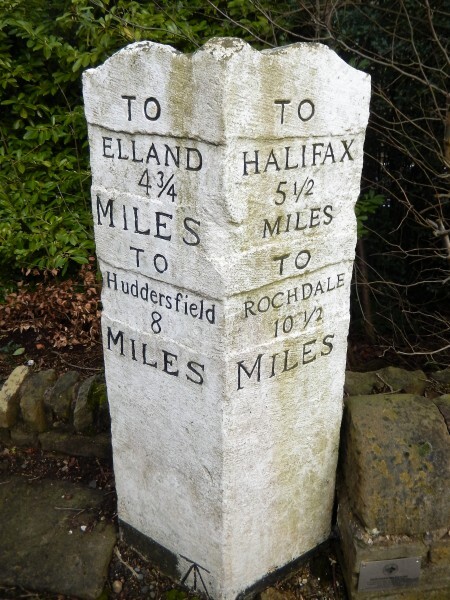 Final distance 17.5 miles, Time 7.0 hours. 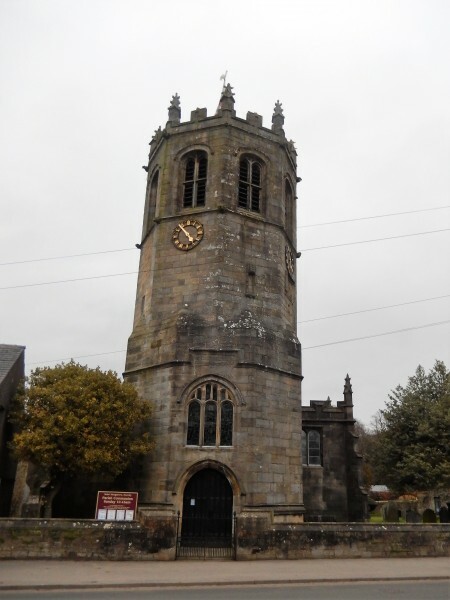 Pictures below from Don and Hilary. 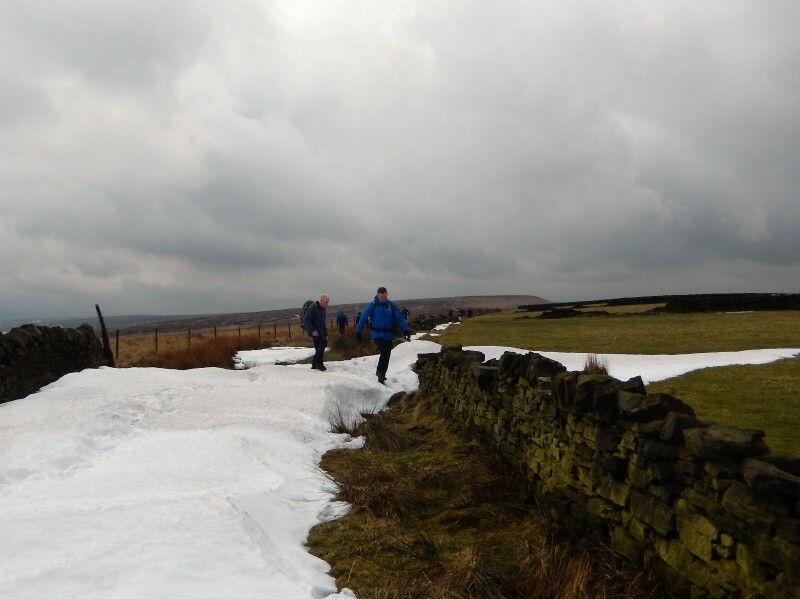 Sunday March 11th. 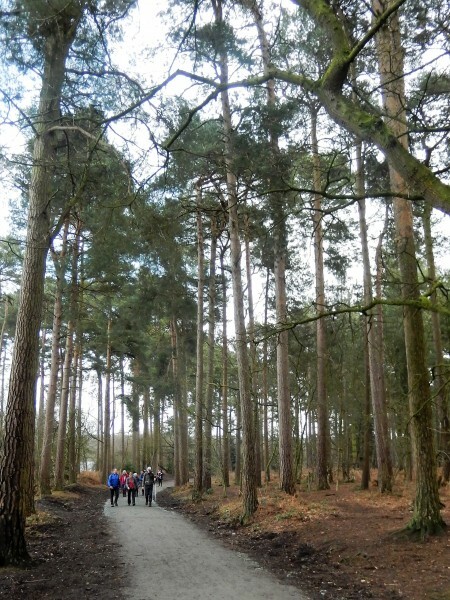 Forest Footprints. 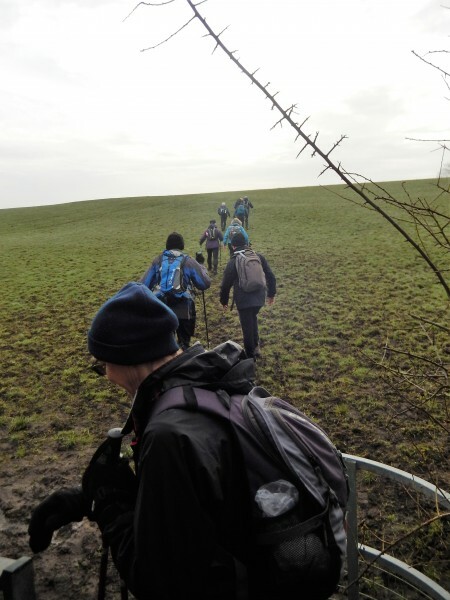 19 miles. 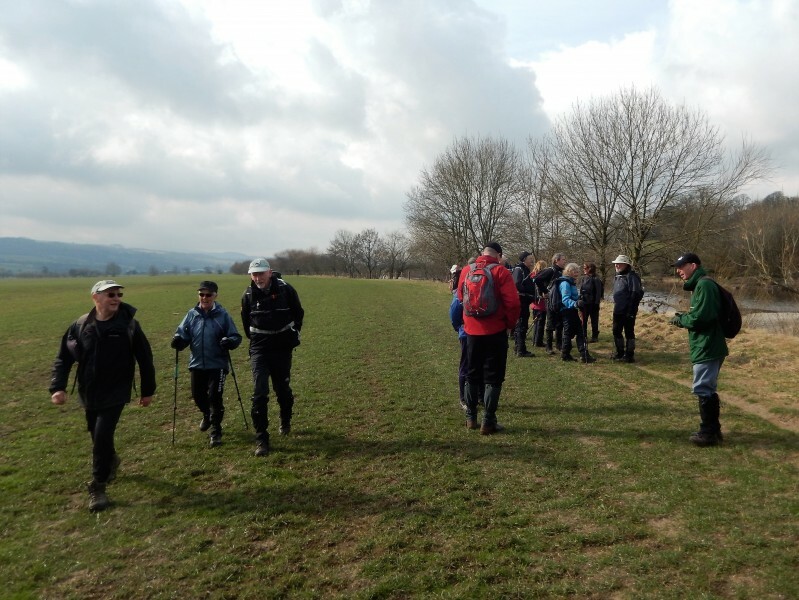 Leaders: Howard and Neil Smith. 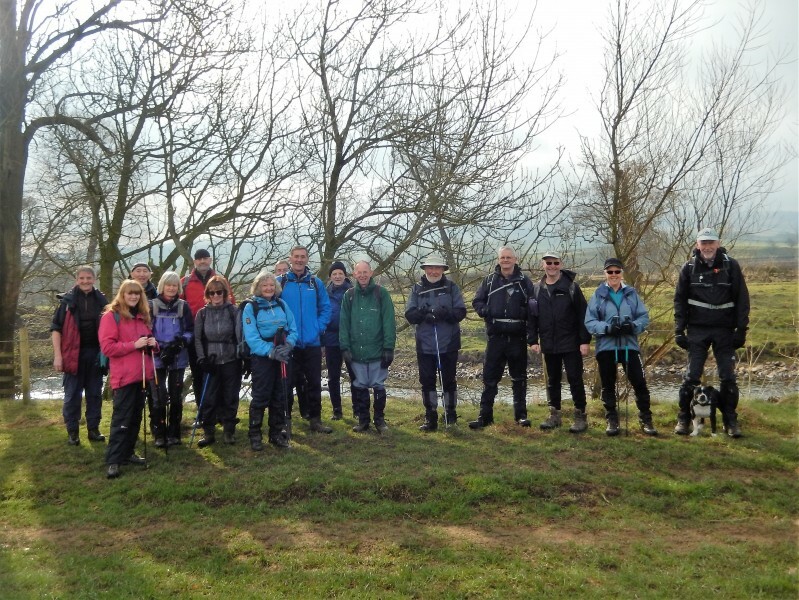 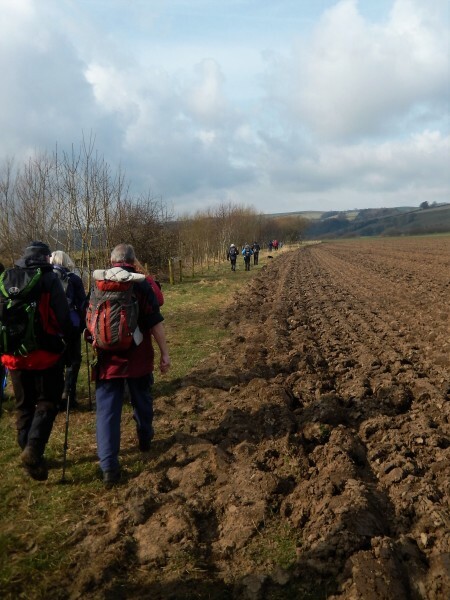 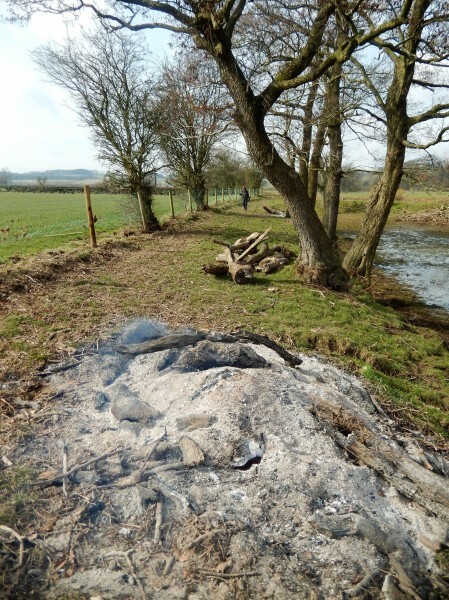 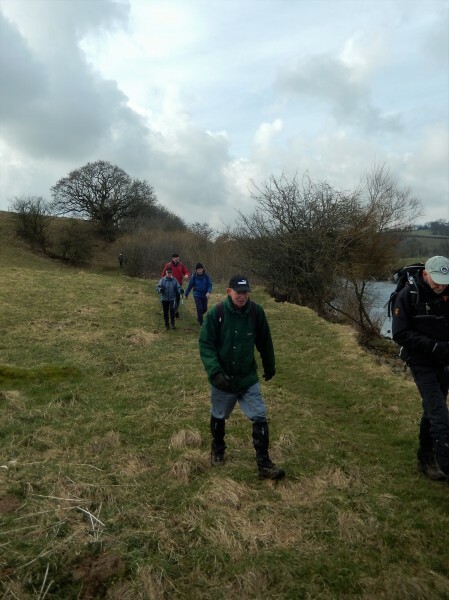 As we have done this walk on several occasions over the years I decided to change the route ever so slightly, mainly because of the severe weather conditions over the past few months and to avoid the flooded fields by the river Weaver which was on the original route. 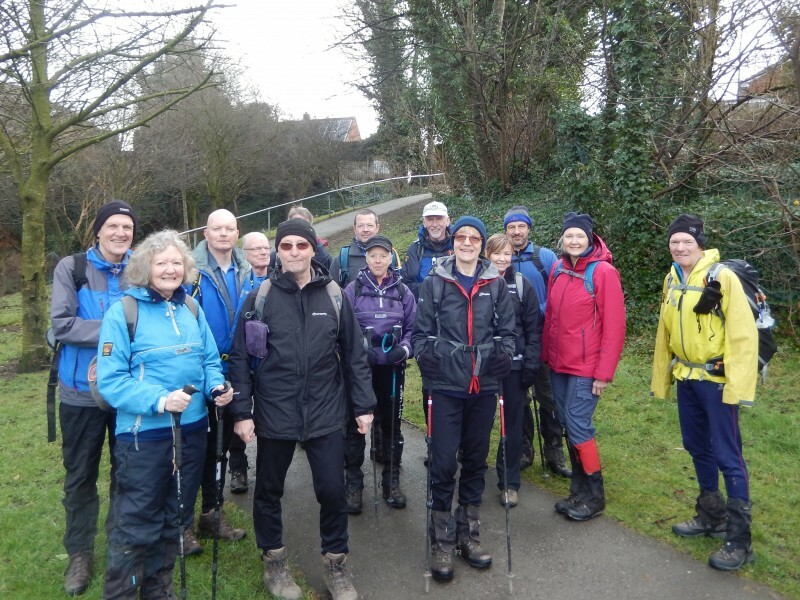 15 walkers set off from Frodsham railway station on what I can only describe as a spring like morning. 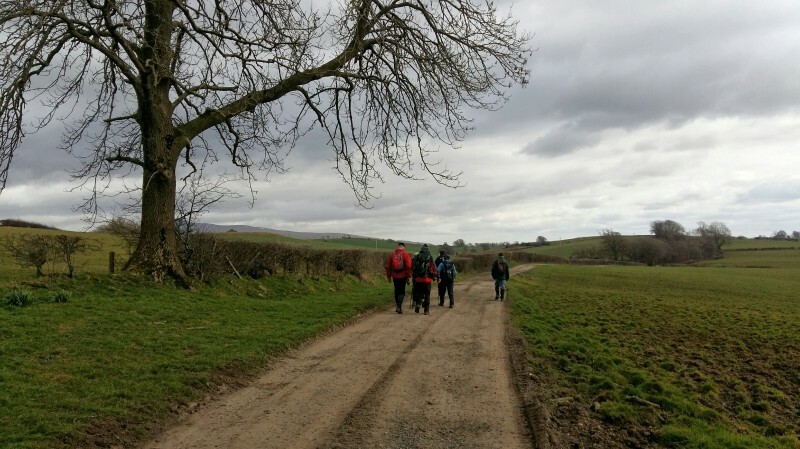 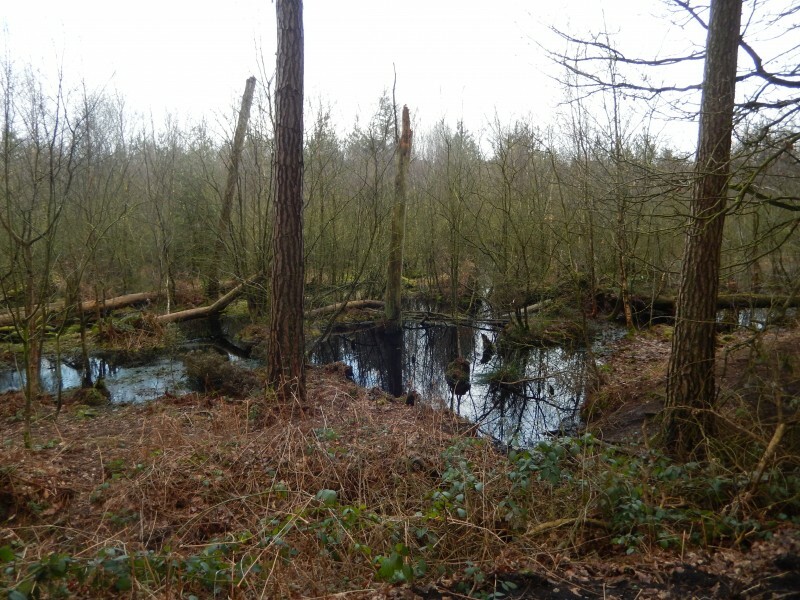 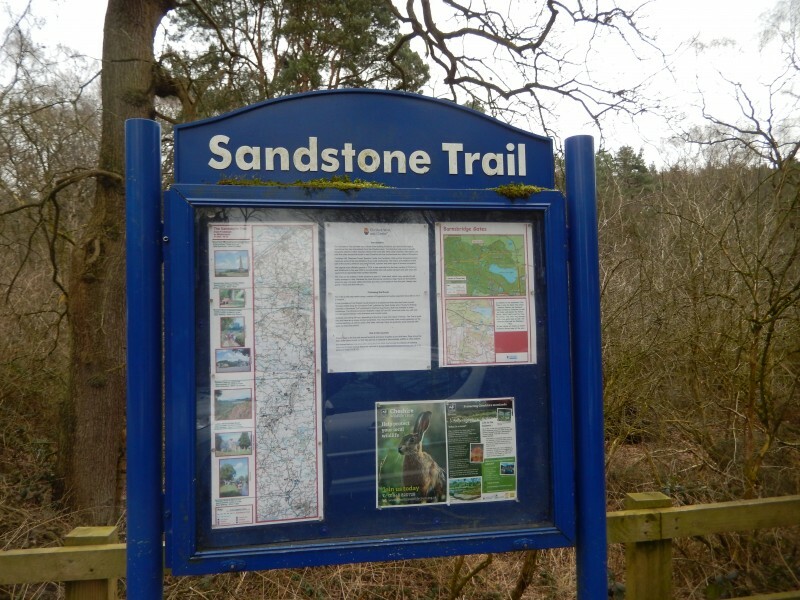 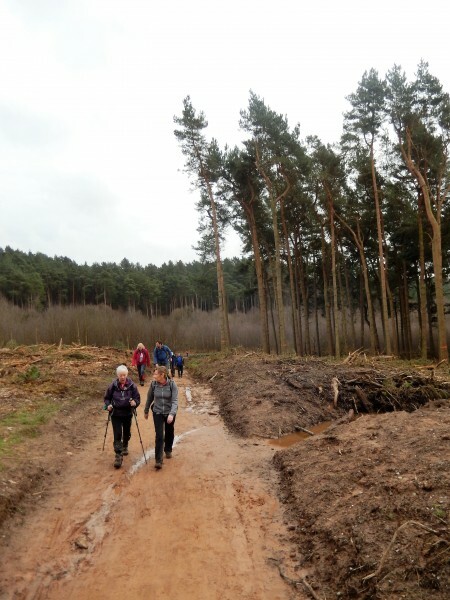 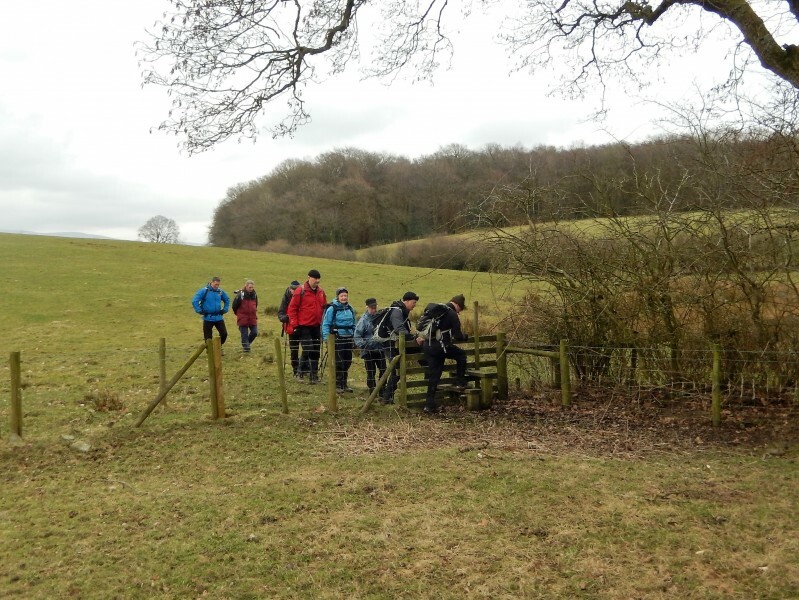 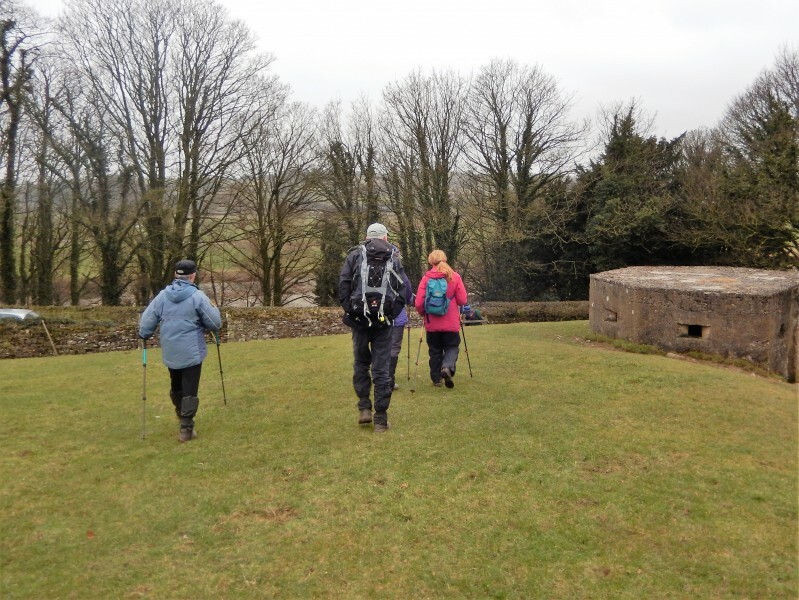 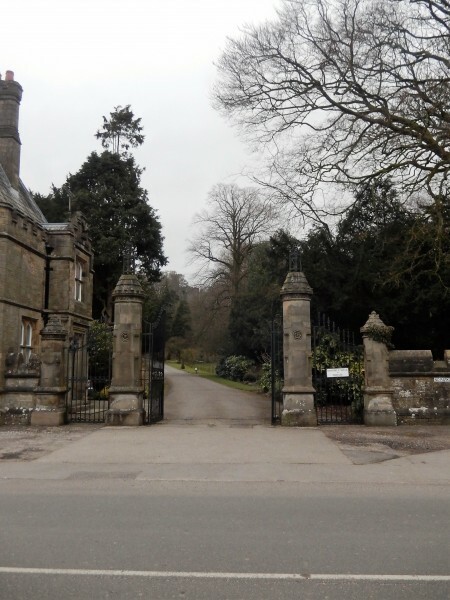 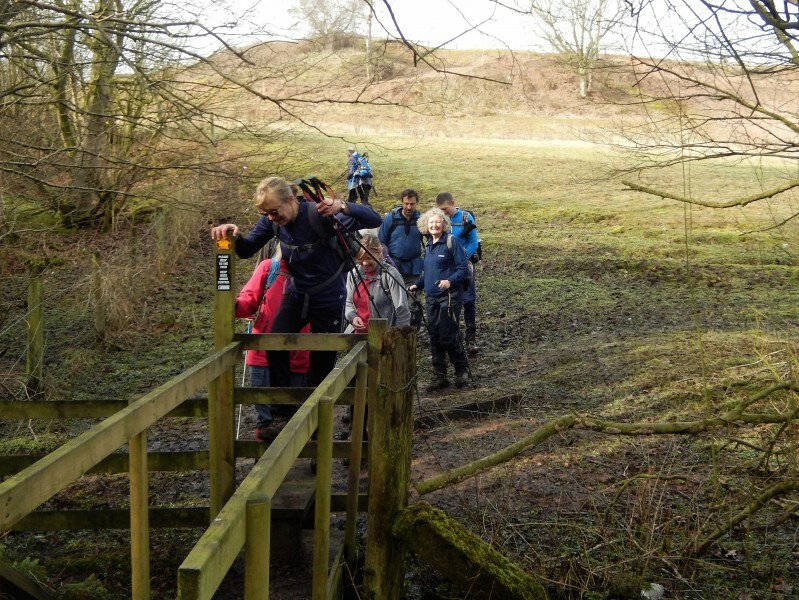 Unfortunately there is no avoiding the road section at the beginning of this walk, but it wasn't long before we turned off at Newtown and made our way to Catton Hall and through Hunters Wood nature reserve before stopping at Kingsley for our morning break. 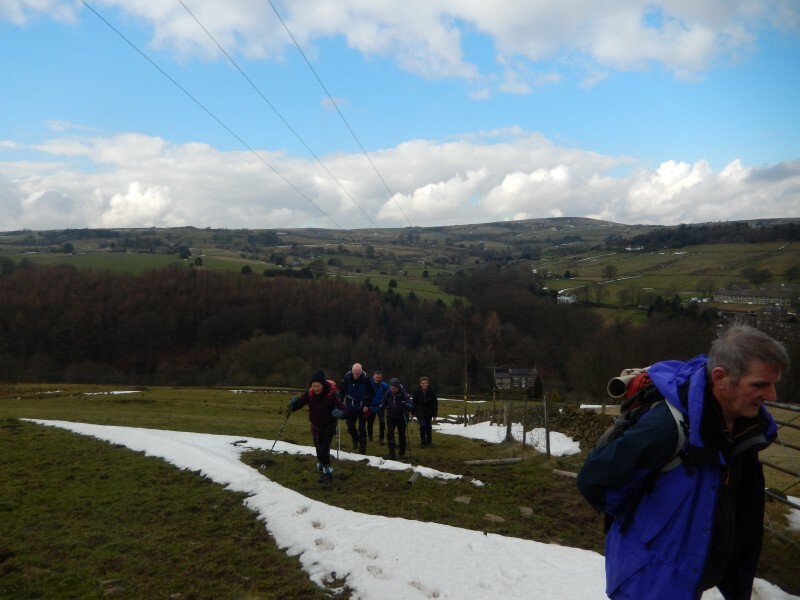 The majority of us by now had ditched the winter coats as the sun made an appearance. 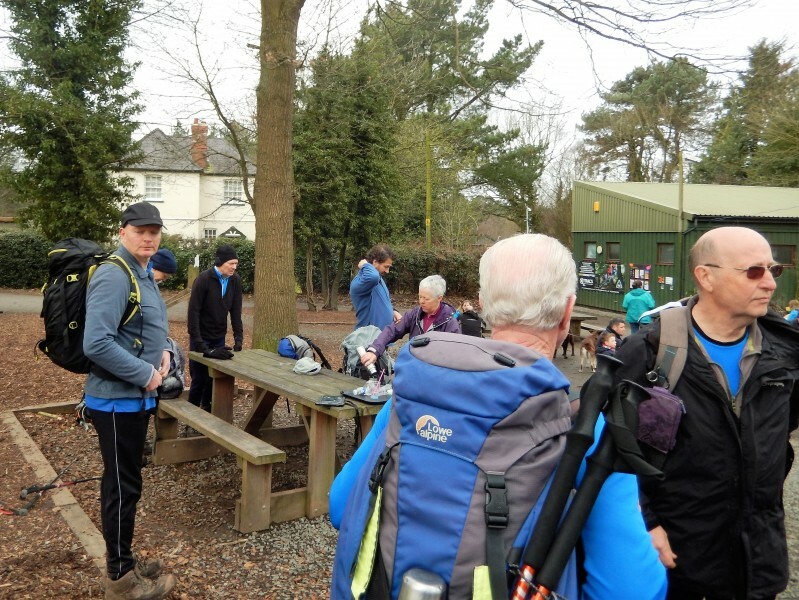 We were back on the original route now for a short section past Mount Pleasant and onto Beech lane where I had rejigged the route again, heading past Norley Hall and then into Norley itself before picking up the Delamere Way and into Delamere Forest. 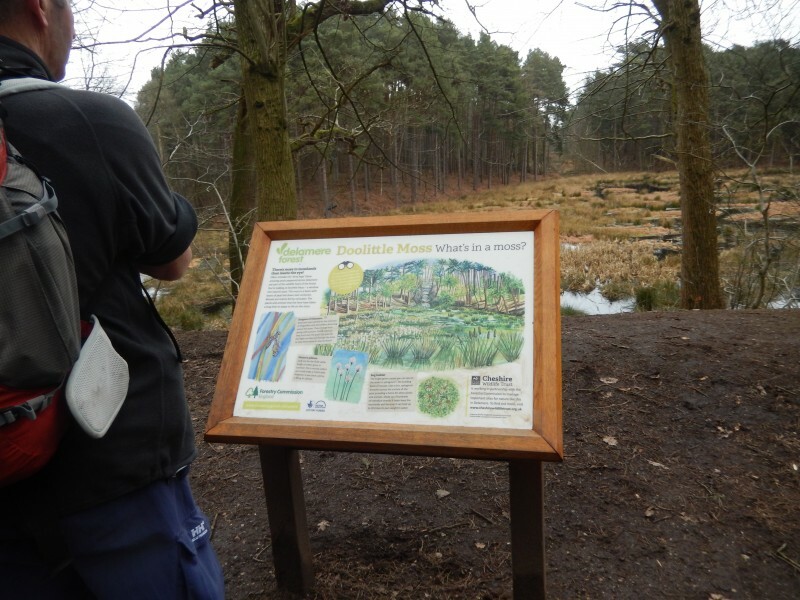 We followed the southern edge of Blakemore moss before making our way to the visitors centre for lunch, i was concerned we would have nowhere to sit as they were hosting the Resolution charity run in aid of the stroke foundation and it was extremely busy with competitors and visitors alike. 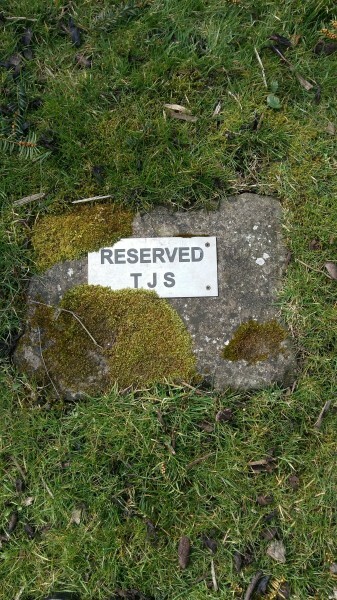 Fortunately some tables became available so we seized the opportunity and grabbed them. 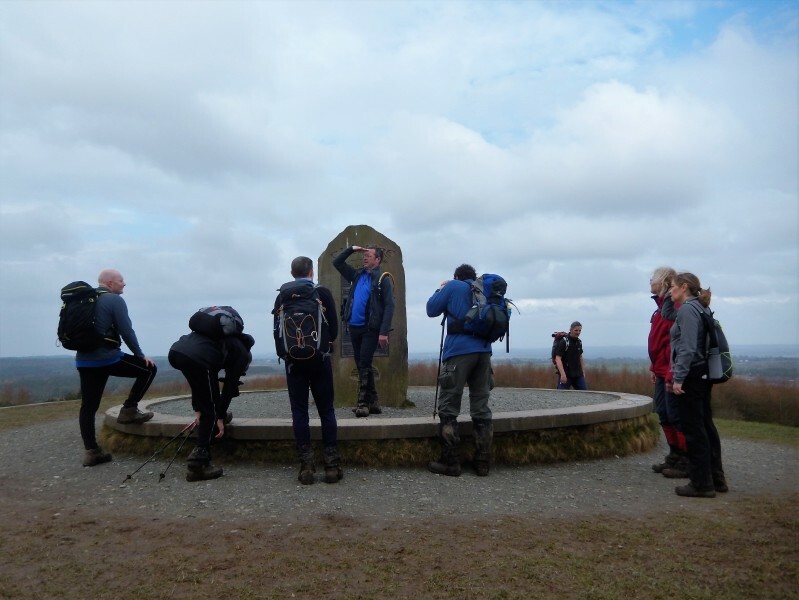 After lunch we made our way up to Pale Heights, a circular stone plinthed toposcope that looks out over Delamere forest and Blakemore below; to the west are the Clwydian range, to the north the Mersey and to the east the distant Pennines, on a clear day its worth the climb to take in the views. 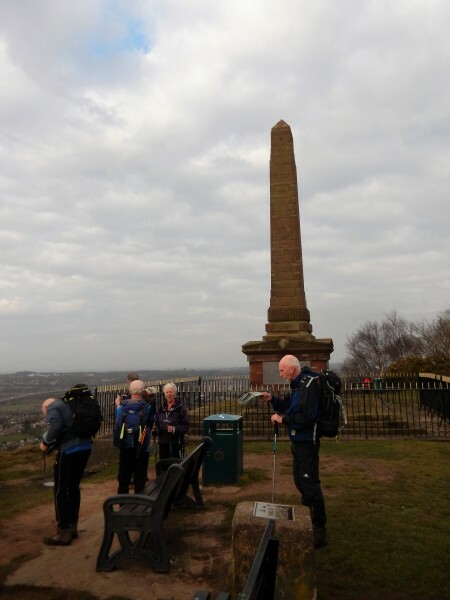 From the summit we made our way back down to pick up the Sandstone Trail (which would accompany us all the way back to Frodsham) to Barn Bridge Gates where every body passed up on the opportunity to have an ice cream. 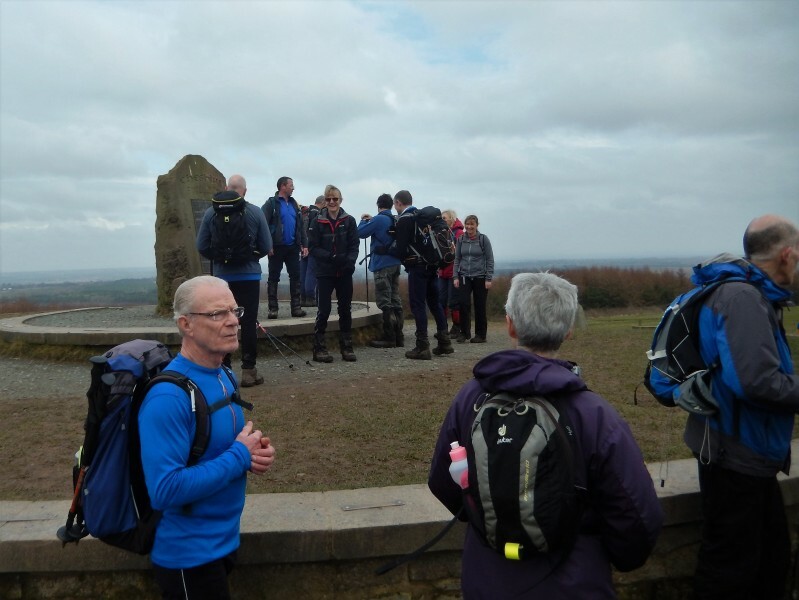 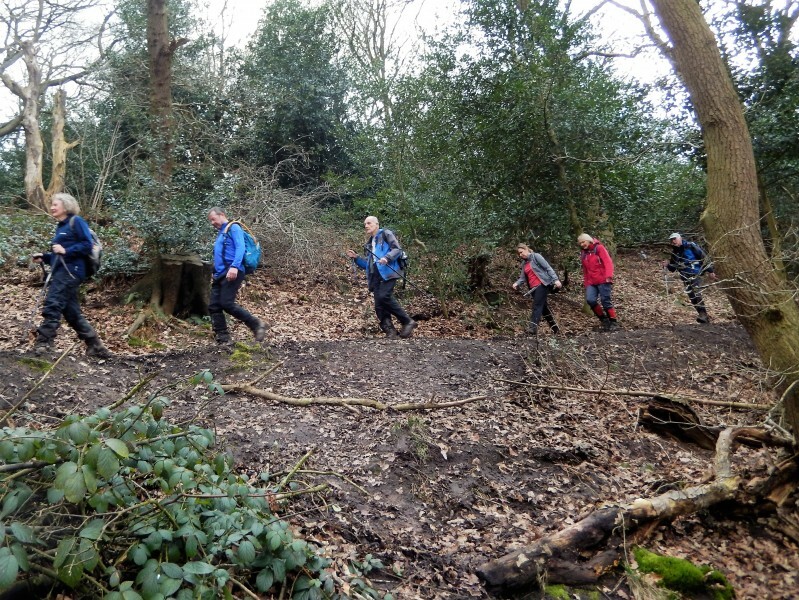 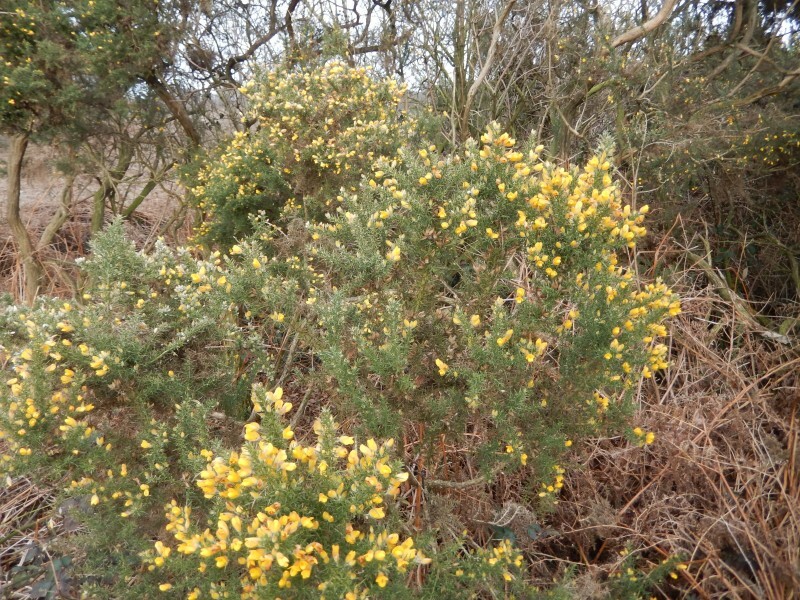 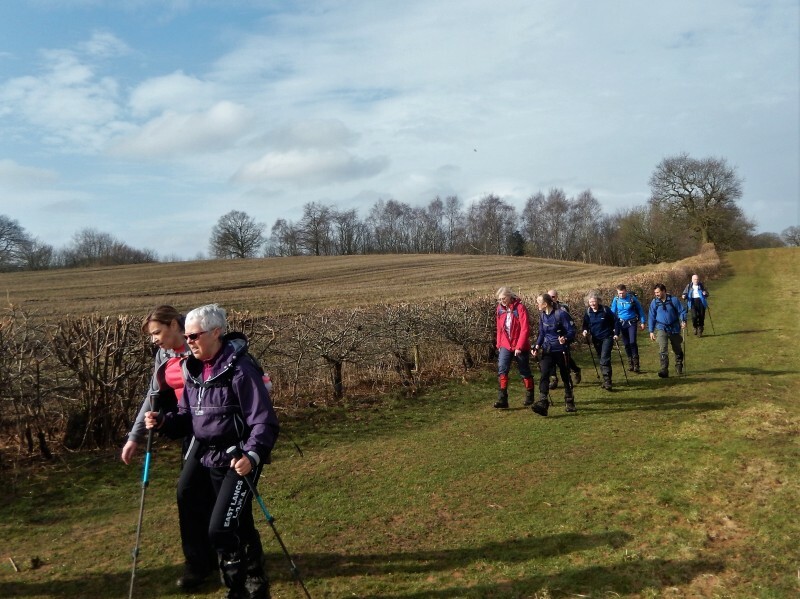 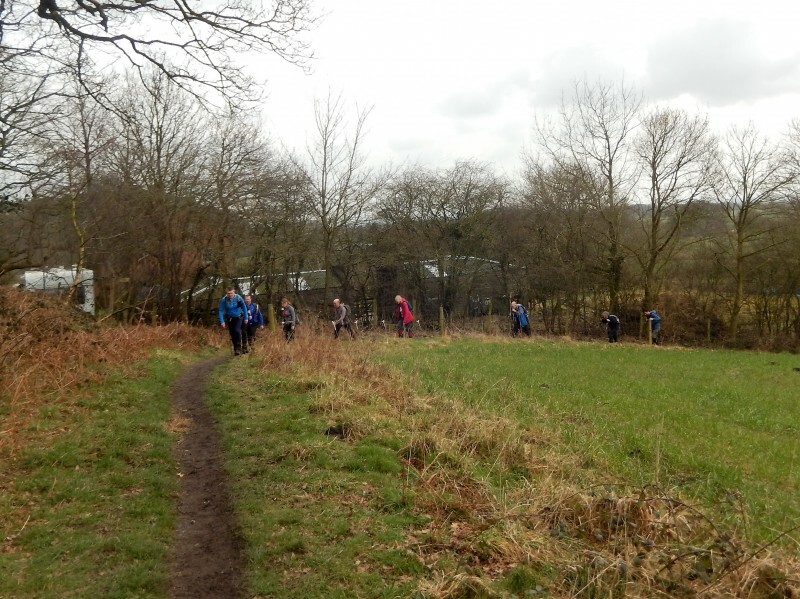 We exited the forest at Manley Common where we stopped for a re group before passing Stonehouse Farm, much to the disappointment of some of the group as we had stopped here in the past for tea and scones. 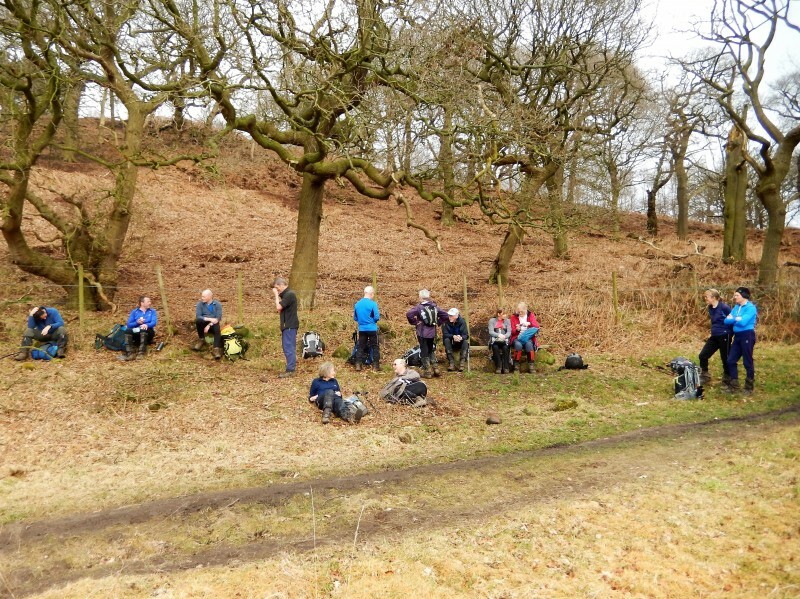 We carried on to Alvanley Cliff where we stopped for our afternoon break, no tea and scones but at least it was a nice warm afternoon. 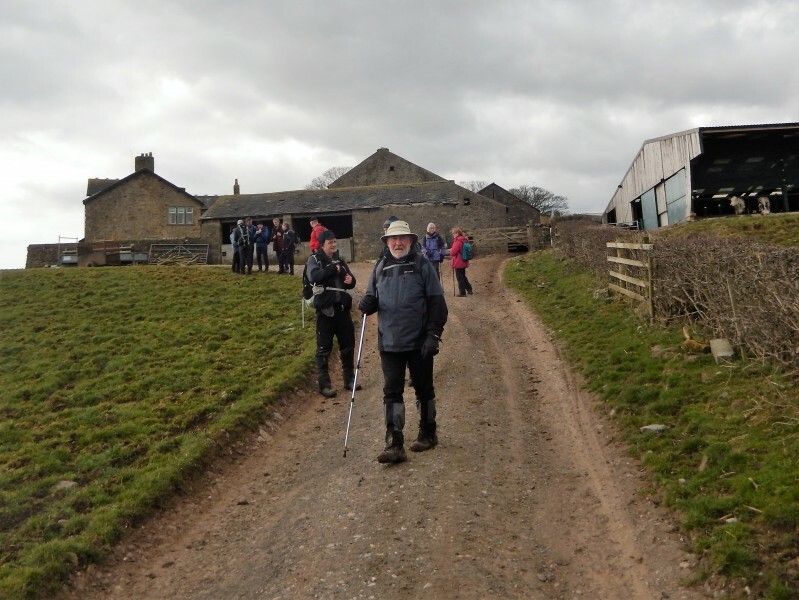 Whilst having our break Michael had asked me a question about a timber building that we had just passed, I was unsure at the time about the correct information about the building, so this is for you Mr Bushby. 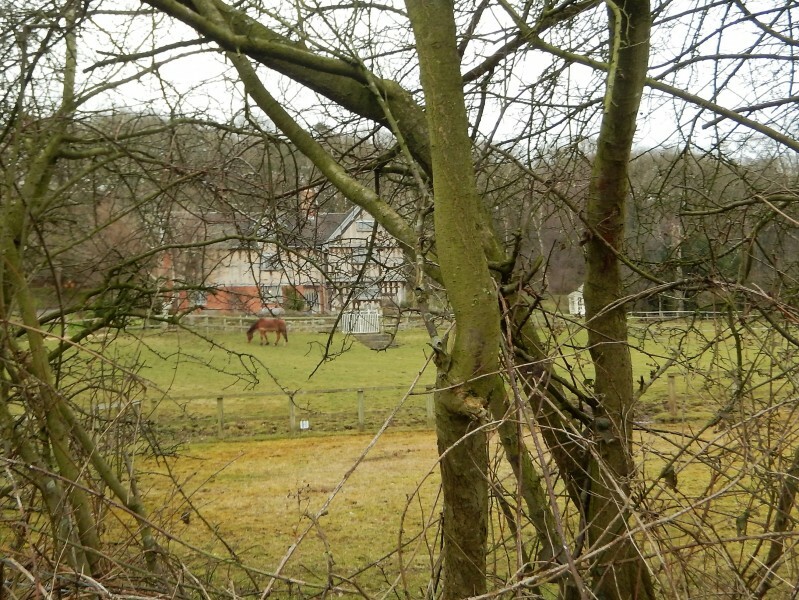 The building in question is called Austerson Old Hall, the grade II listed 15th century three storey timber framed farmhouse stood 27 miles away at Coole Pilate near Nantwich in Cheshire. 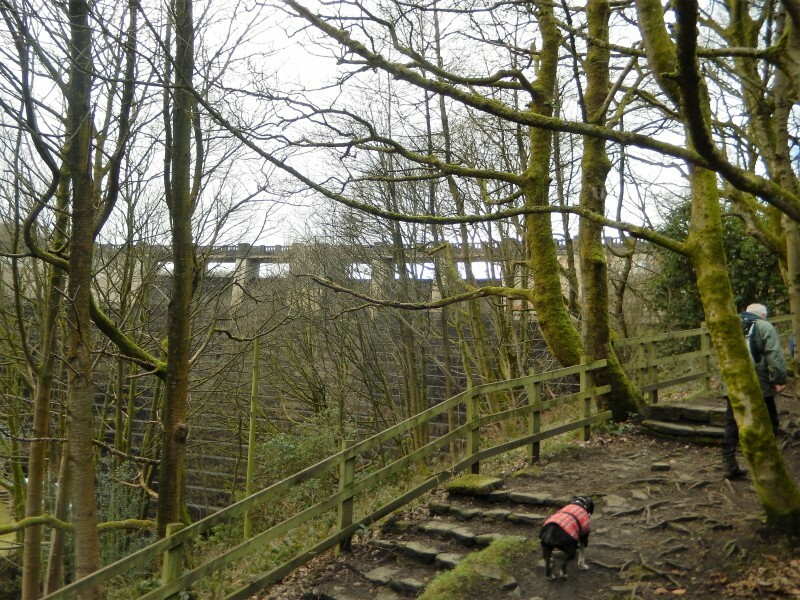 It lay derelict before being spotted by a Chester architect, he had it dismantled and moved to Alvanley Cliff where it was lovingly reassembled, the work took 12 years to complete from 1974 to 1986. 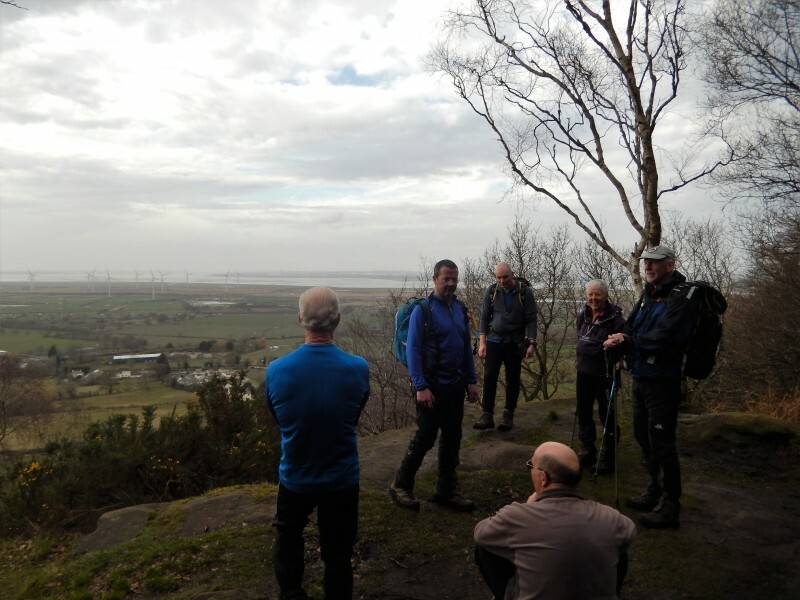 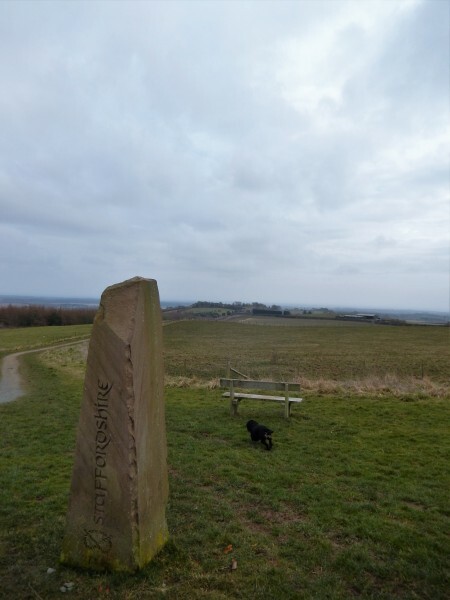 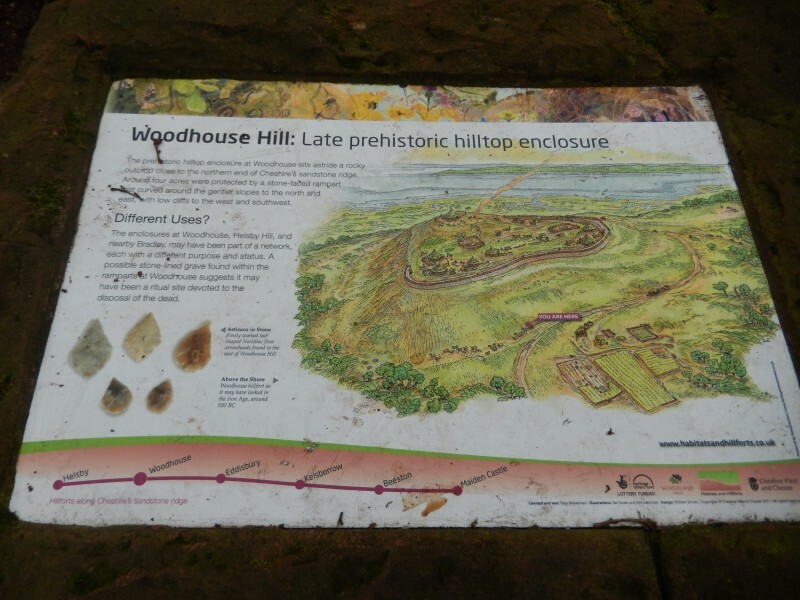 History lesson over, we continued to Woodhouse Hill before stopping to admire the views at Scout Rock from Woodhouse viewpoint with broad vistas across the fields to Helsby Crag. 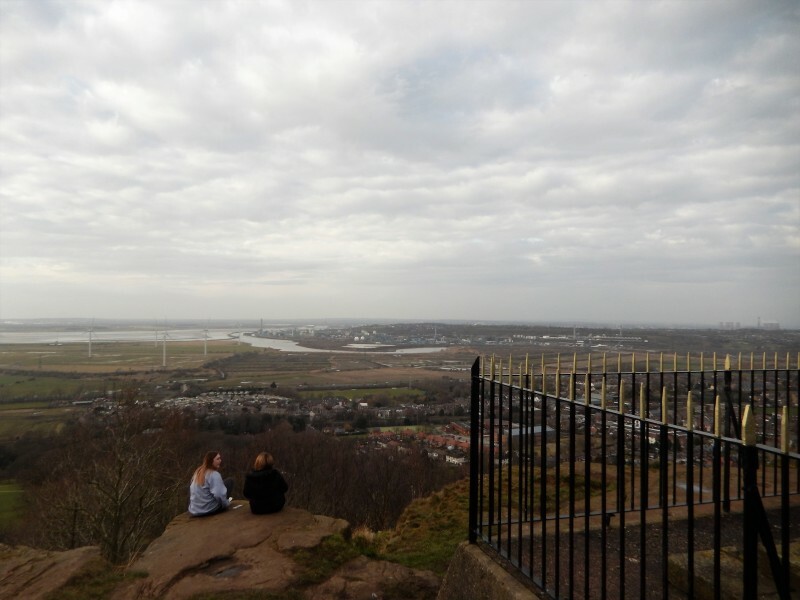 We battled our way through the mud to reach the war memorial which commemorates local men who died in the Great War of 1914-1918, our last chance to take in the views, the panorama spans the vast expanse of the Mersey Estuary. 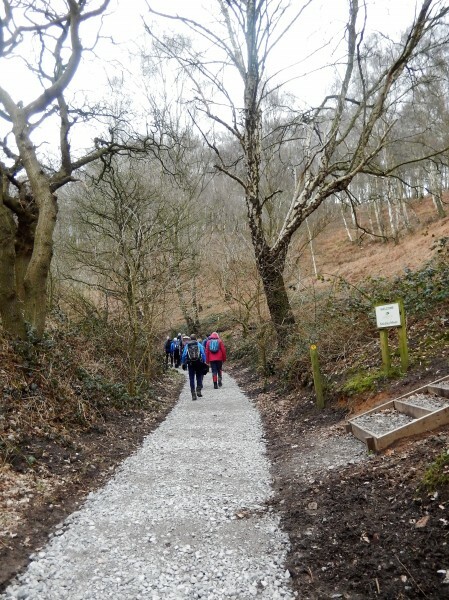 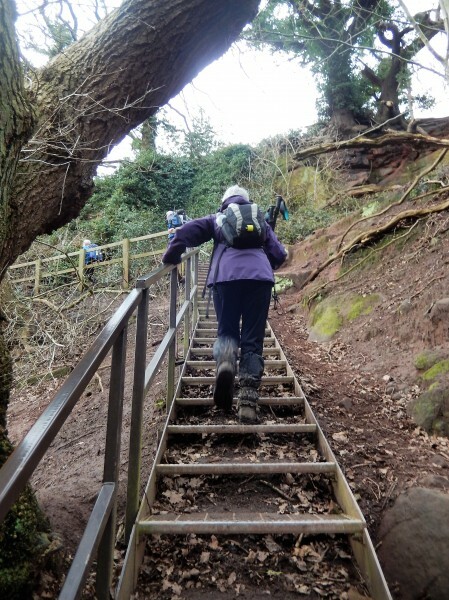 It was all down hill from here as we zig zagged the newly laid gravel path on our final stage of the Sandstone Trail/ Forest Footprints before reaching the station car park at 16.25, 19 miles completed. 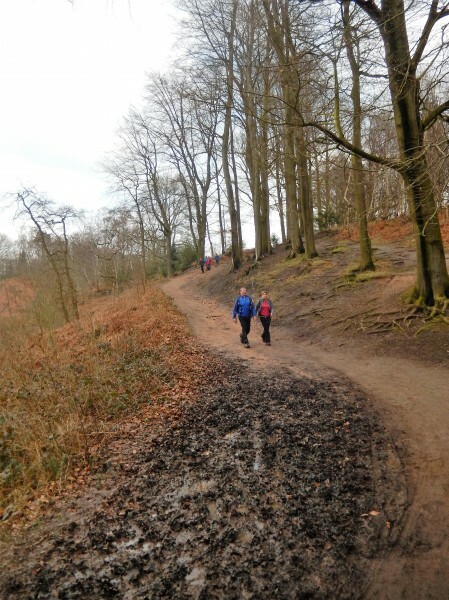 Yes there was plenty of mud but at least the weather was kind. 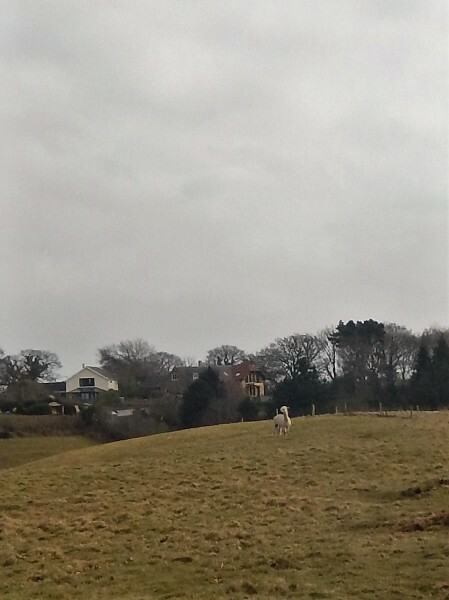 Wednesday March 7th. 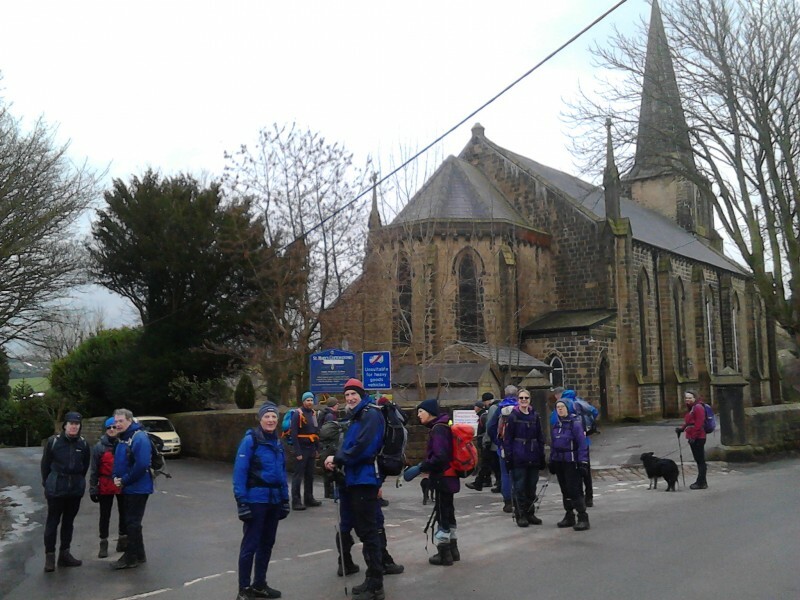 Ryburn Round Plus. 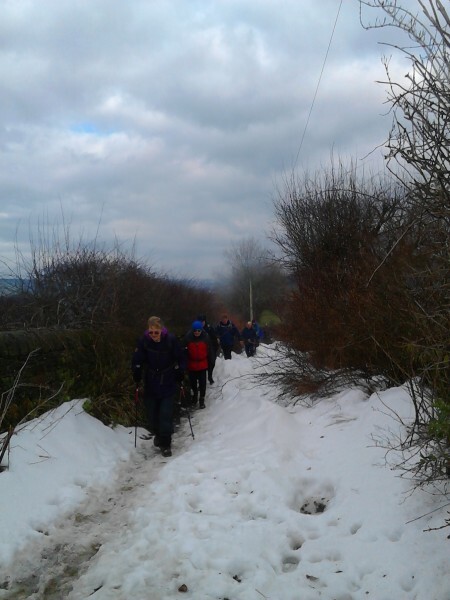 13 miles. 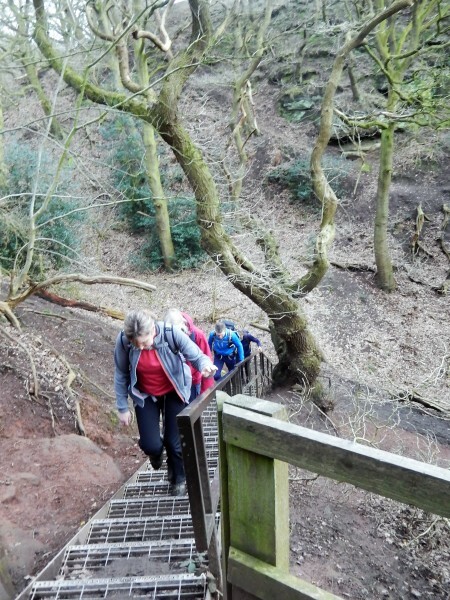 Leader: Barbara Shelton. 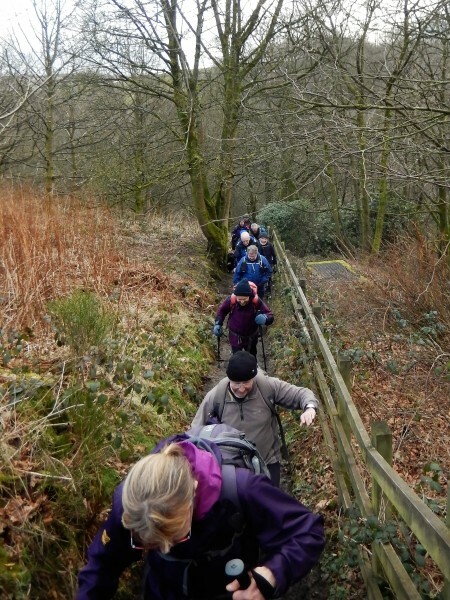 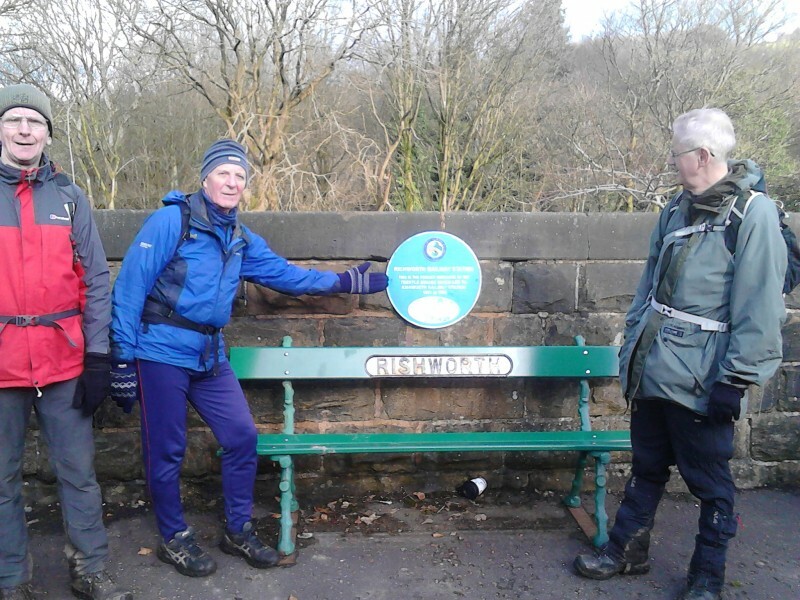 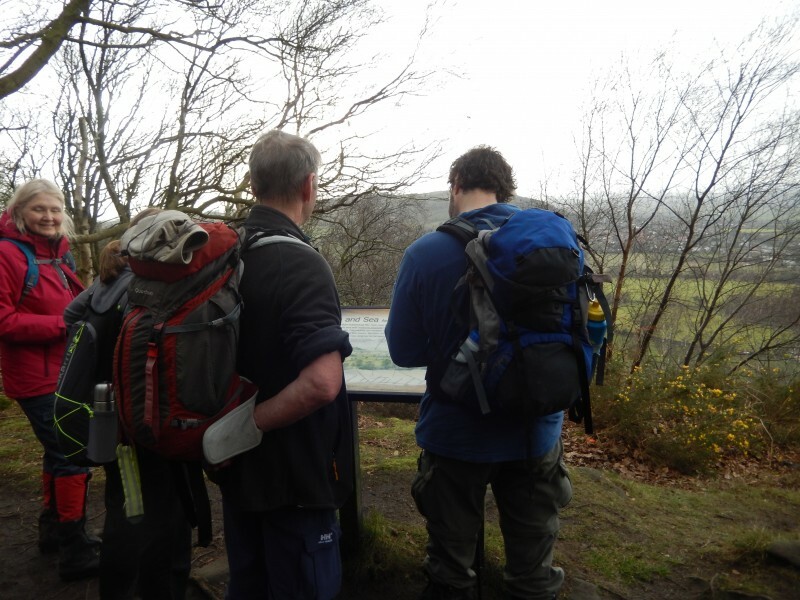 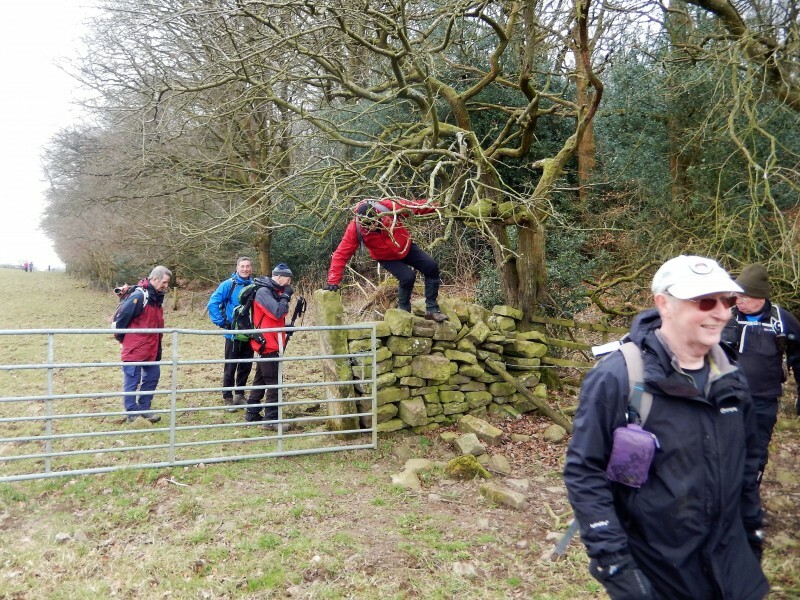 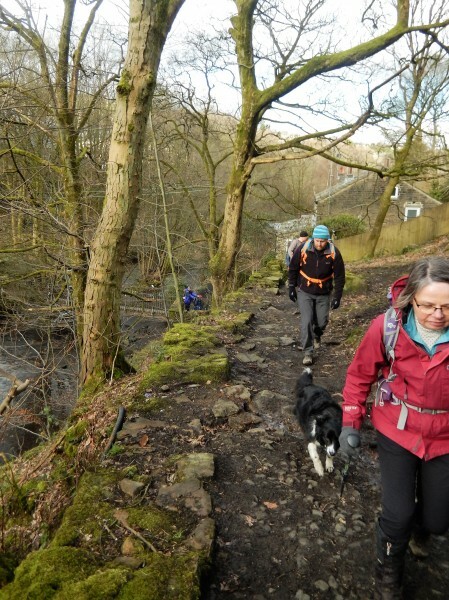 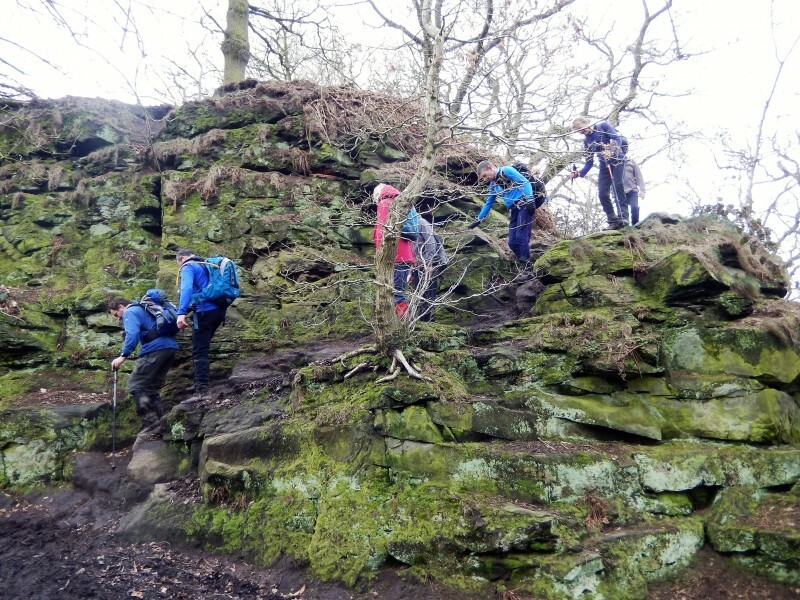 Having enjoyed Mike and Heather's Ryburn Round several years ago I decided to 'borrow' the route with their kind permission, add a bit on, reverse it and include a cafe stop, so that's what we did. 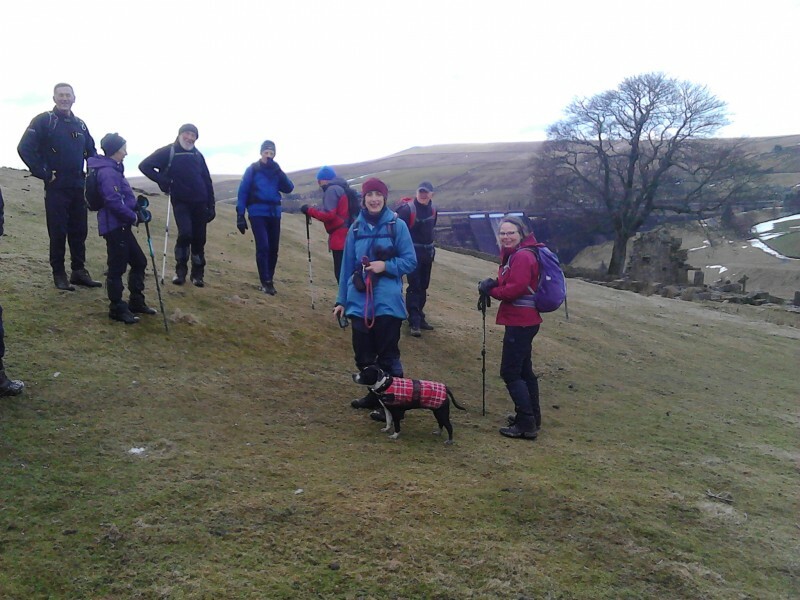 There was a bumper turnout of 23 people and two dogs; I think some were particularly keen to get out after the recent snowbound period, and the forecast was good. 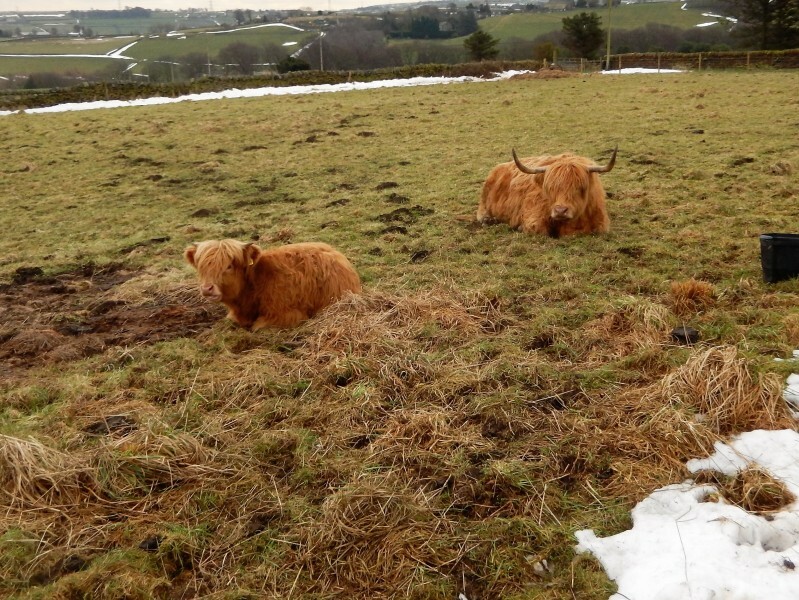 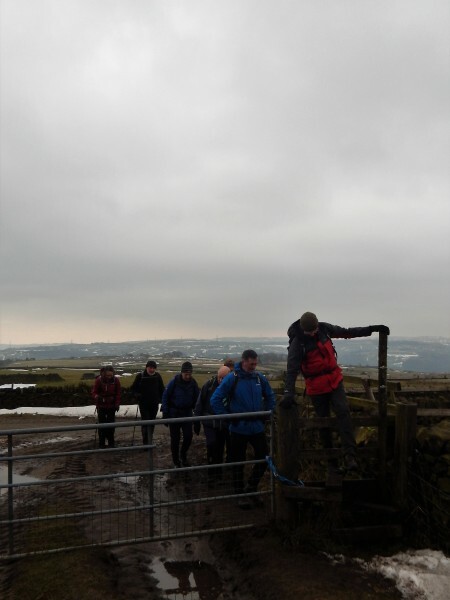 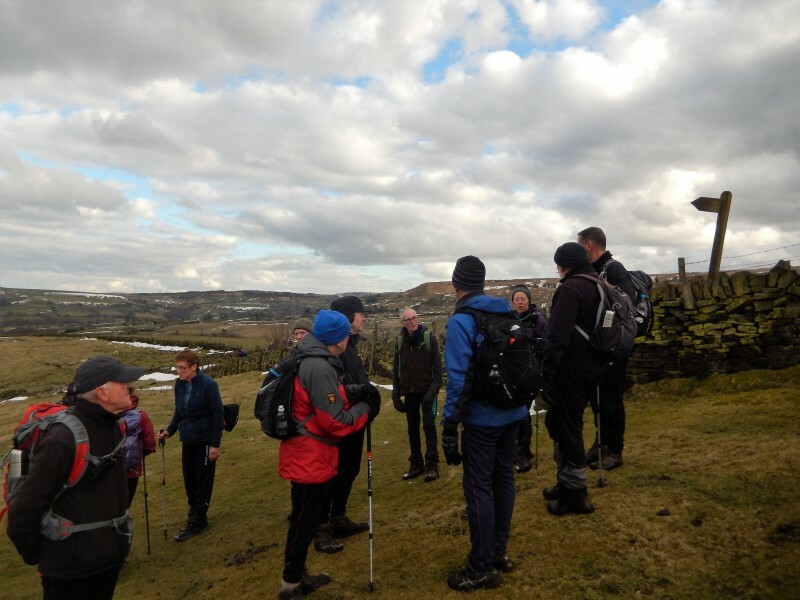 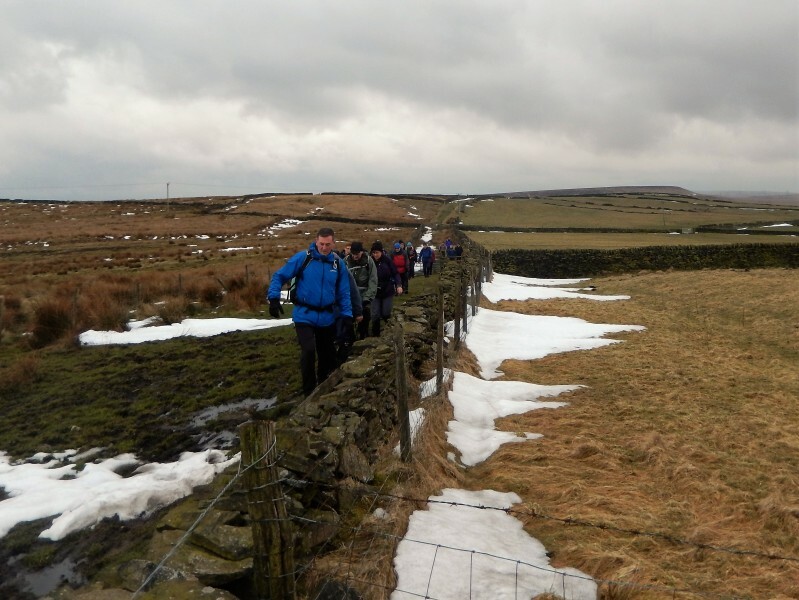 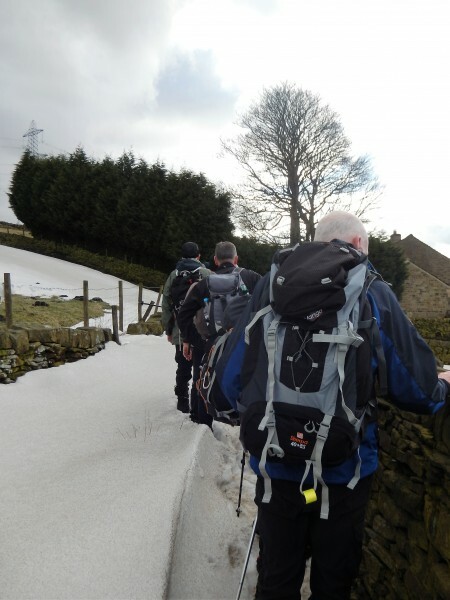 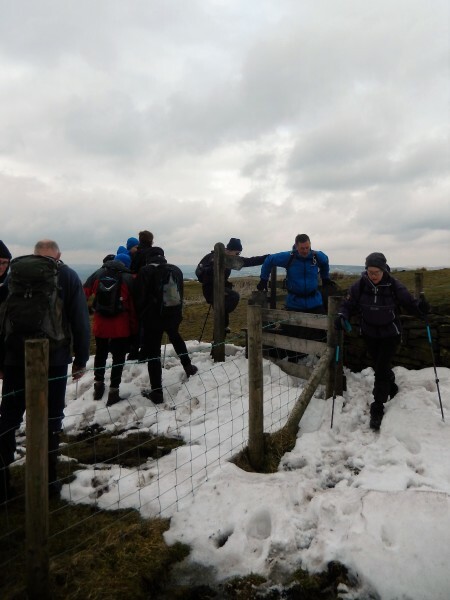 Starting at Baitings Reservoir, on the A58 Rochdale to Halifax road, we were straight into the first snowdrift of the day (gaiters proving their worth) as we headed uphill for Manshead End and Great Manshead Hill where we had panoramic views of the snow-streaked hills all around. 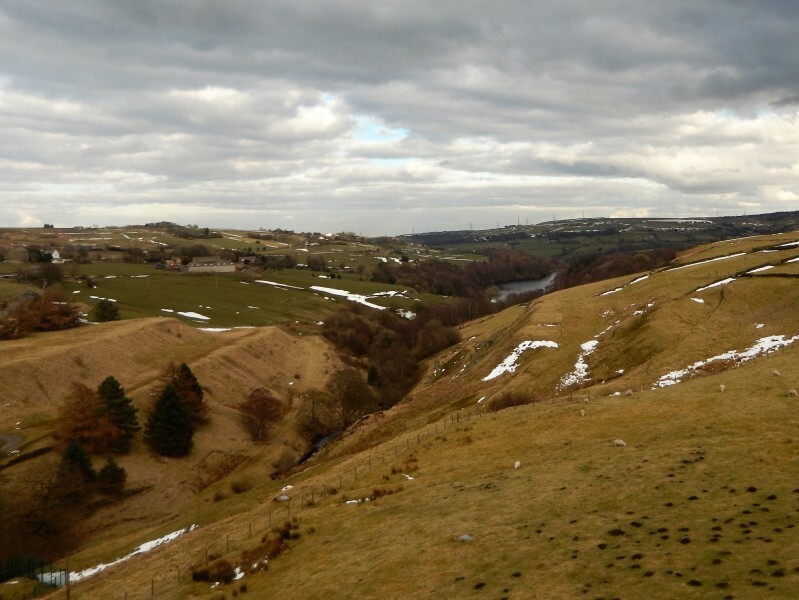 Stoodley Pike stood out prominently to the west above Cragg Vale down in the valley. 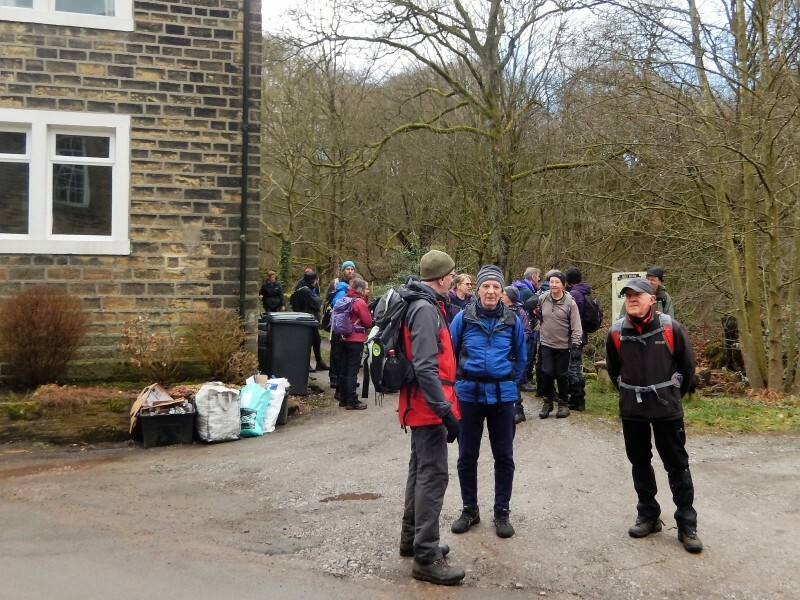 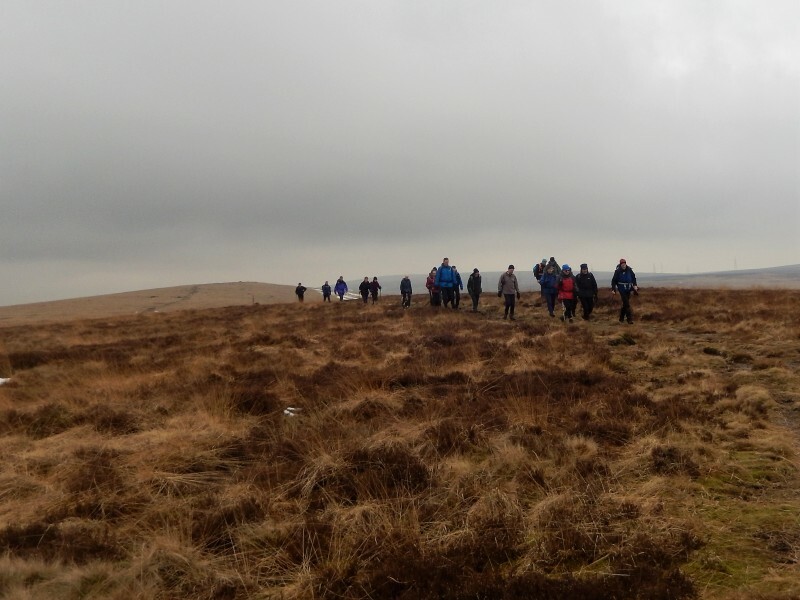 The first break was taken after 3 miles, next to an old building on the moors that was used as a decoy for bombing raids in WW2, when fires were lit to draw the bombers away from the towns below. 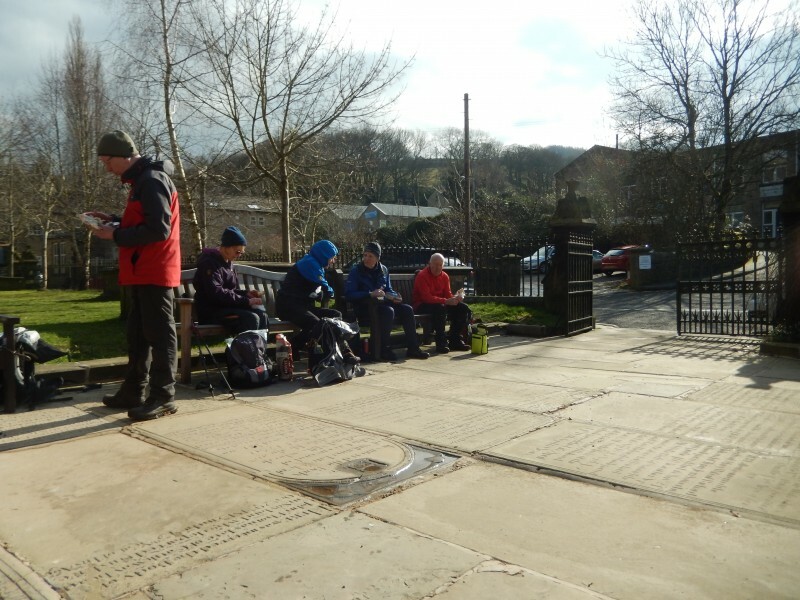 Following lanes and field paths we dropped down to St Mary's church, Cotton Stones, opened in 1848 for the villages of Cotton Stones, Mill Bank and Soyland which we passed through on the way down to Ripponden. 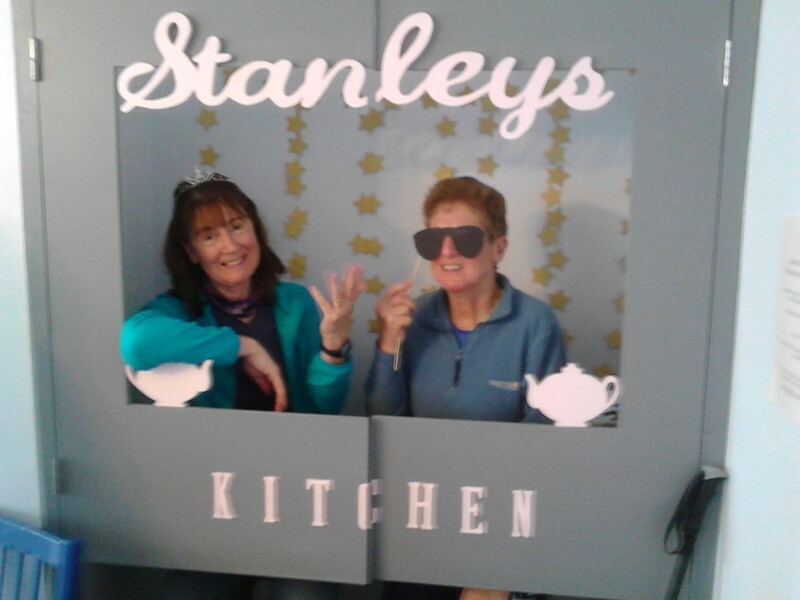 We were in for a treat there, at Stanley's kitchen, where tables had been reserved for us by the cafe owner, Penny, daughter of Geoff, a regular member of the East Lancs group. 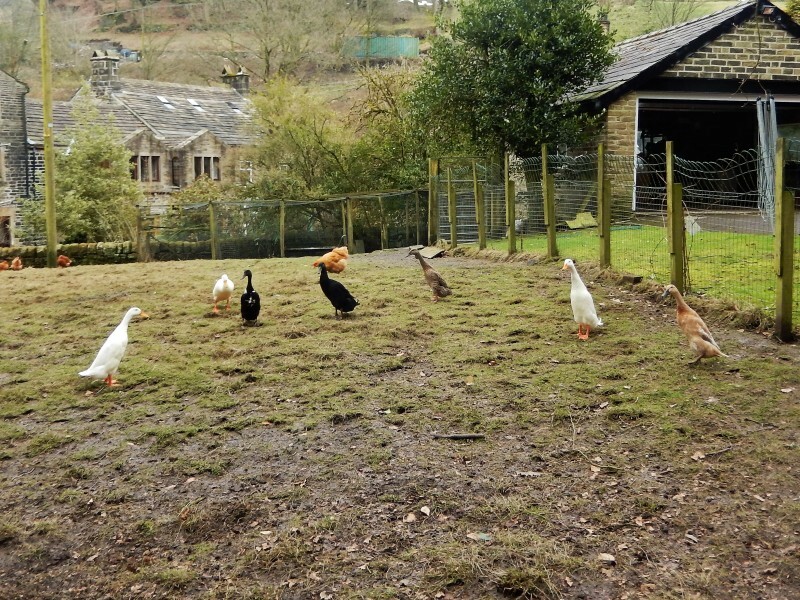 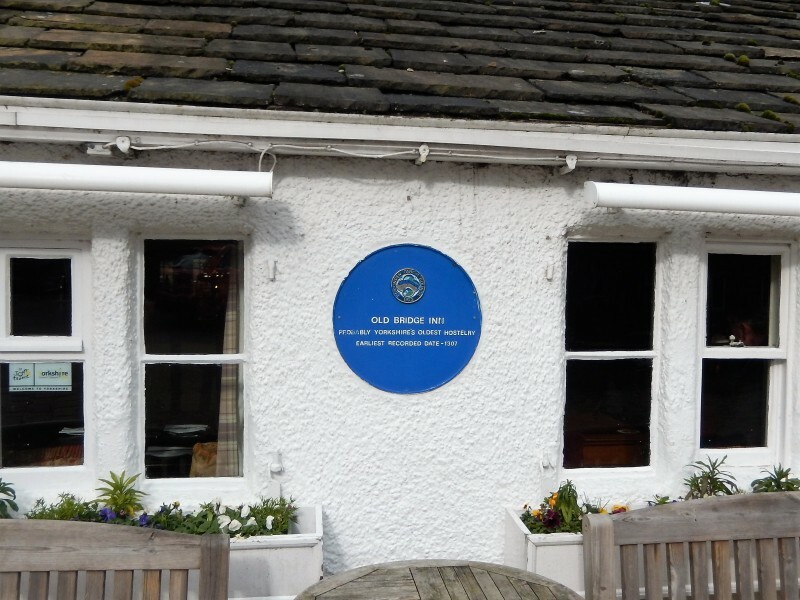 It is situated on Halifax Rd, the main road through Ripponden, and well worth a visit. 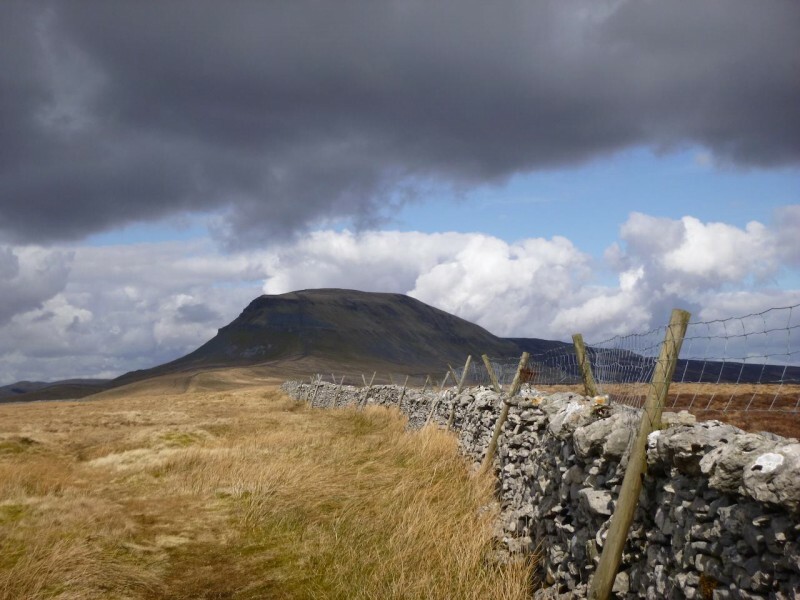 There's an extensive menu, cakes to die for, a warm welcome and a lively atmosphere. 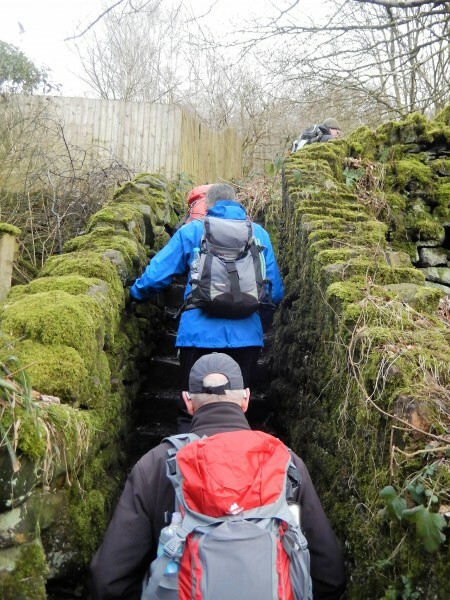 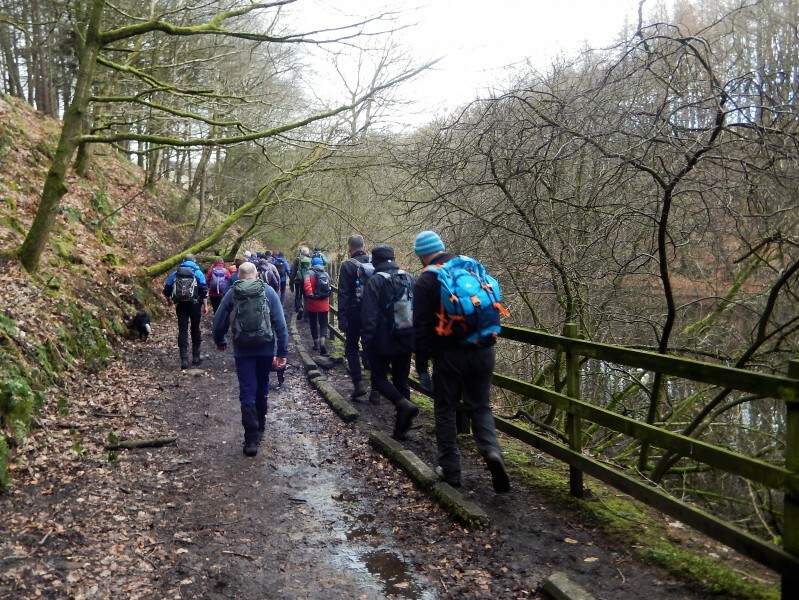 Suitably fortified, we carried on over the packhorse bridge and followed the River Ryburn to ....you've guessed it...... Ryburn Reservoir, with its massive dam wall towering above the path. 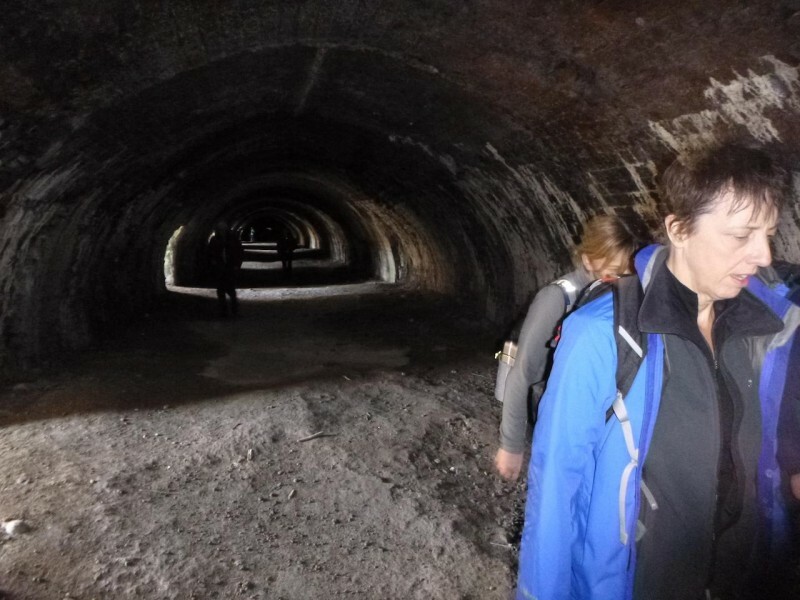 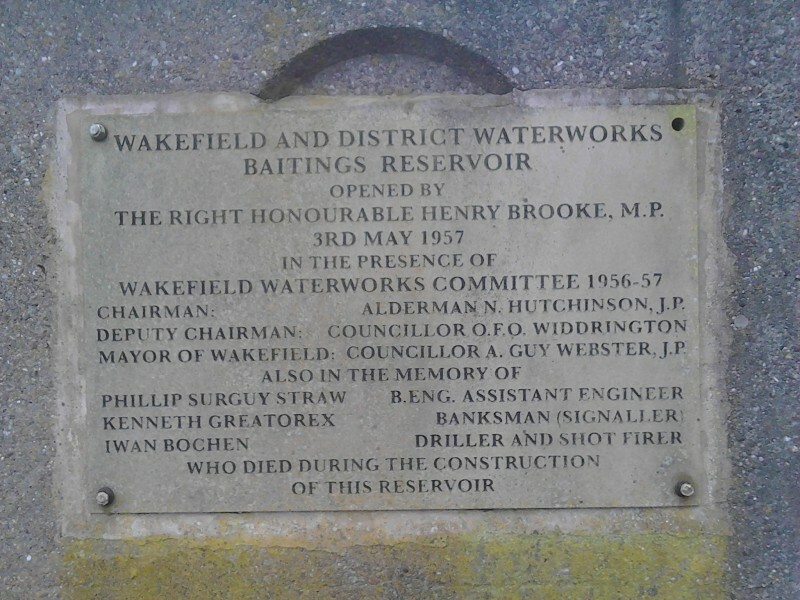 Built in 1933, before Baitings Reservoir higher up, it supplied water to Wakefield. 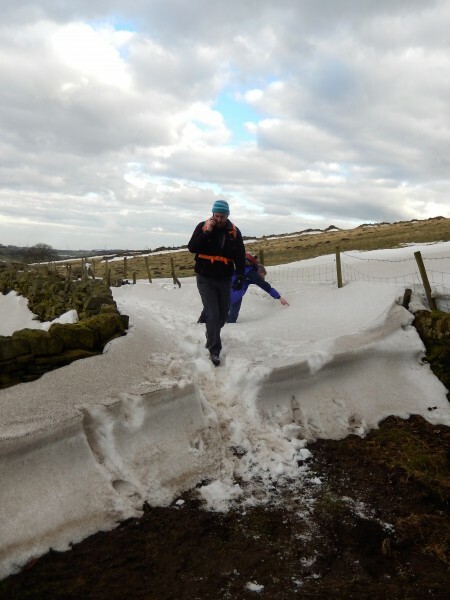 After negotiating one last snowdrift (which yours truly fell into and had to be dragged out!) 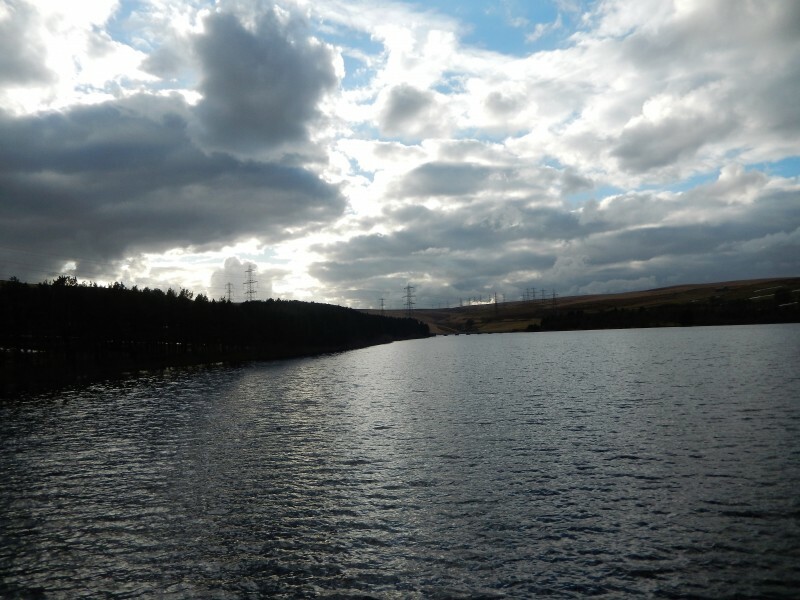 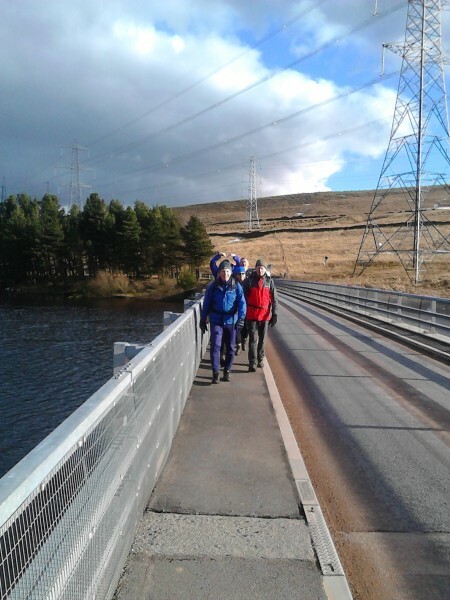 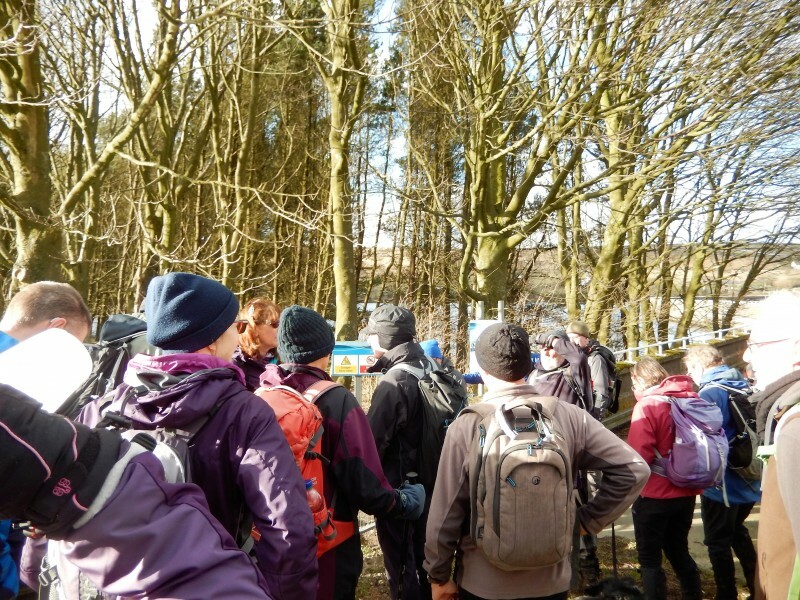 we came to Baitings dam, built in 1956, where the 'short' walkers headed straight over to the car park whilst the 'Plus' walkers went the extra mile round the top of the reservoir to complete the 13 mile walk. 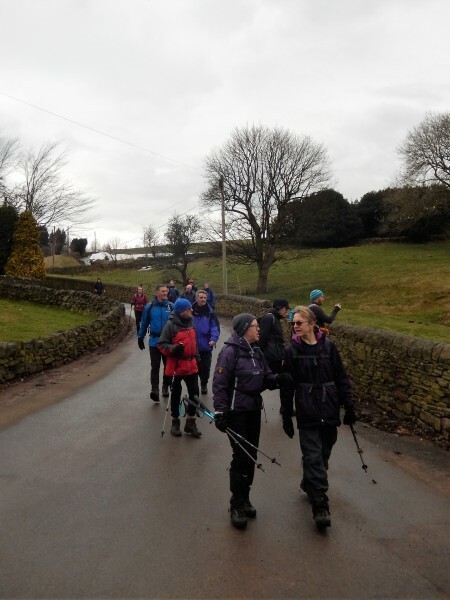 Well done everyone and thanks for a fantastic turnout. 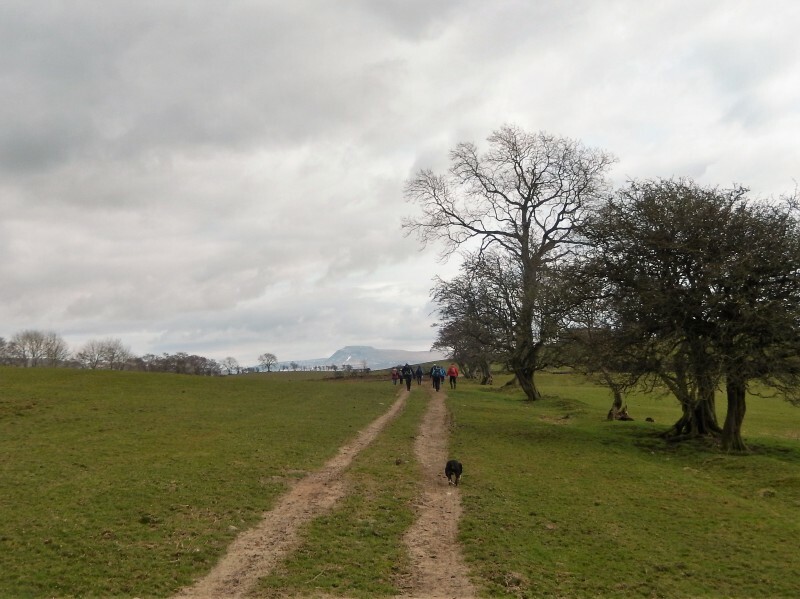 Thank you to Barbara for the pictures below.